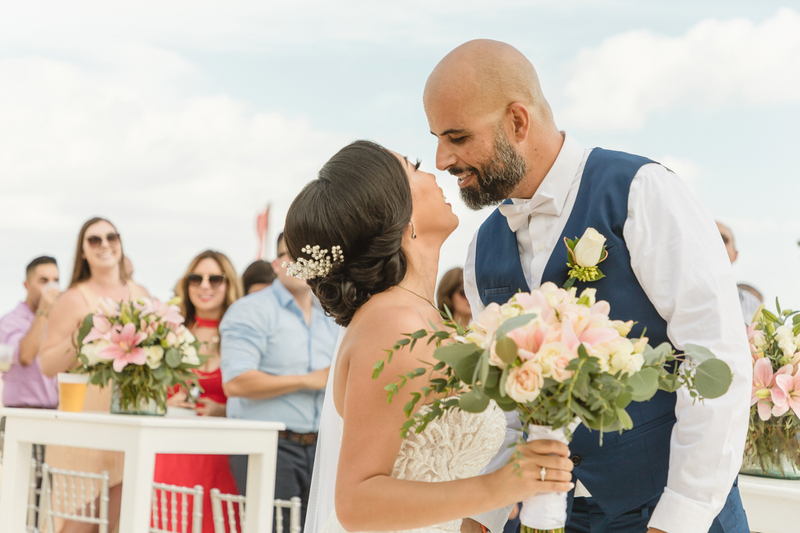 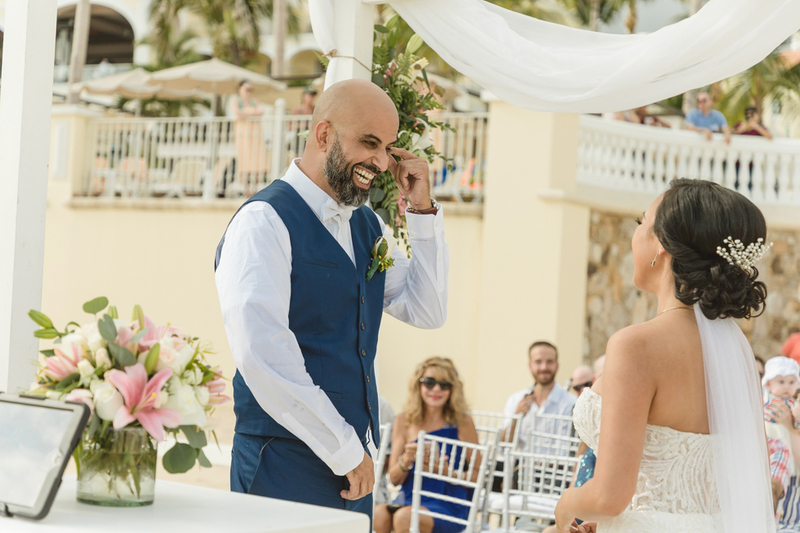 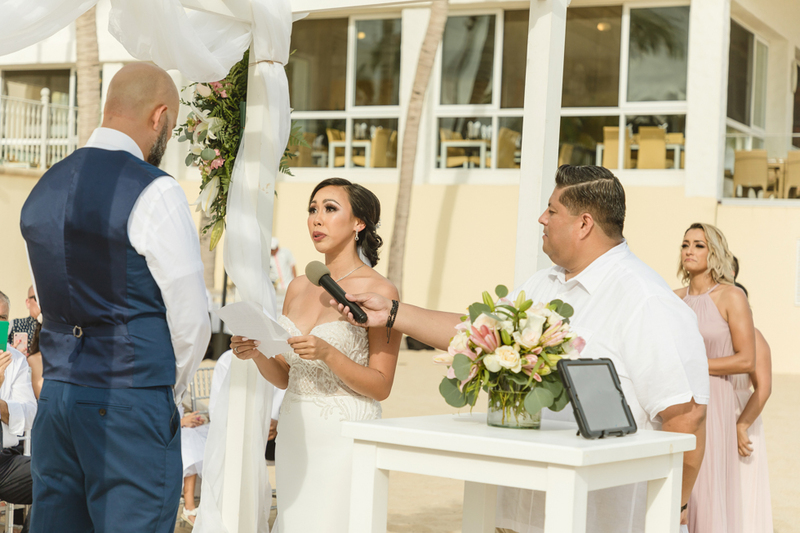 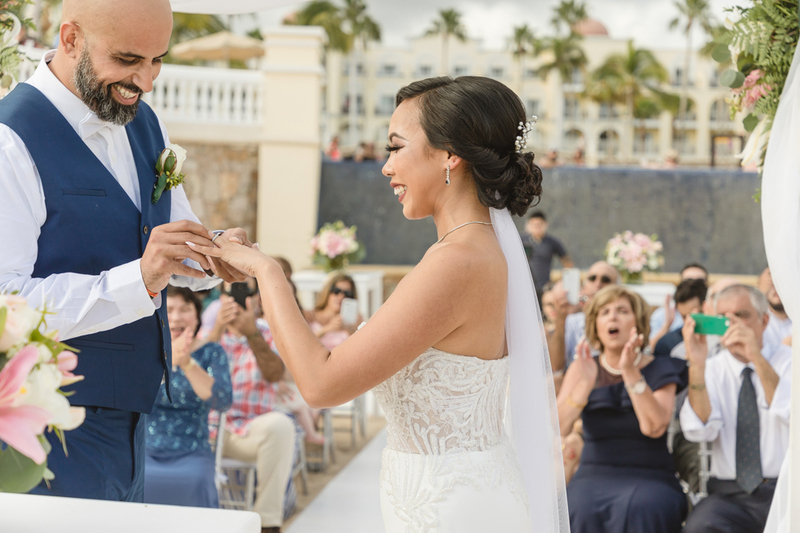 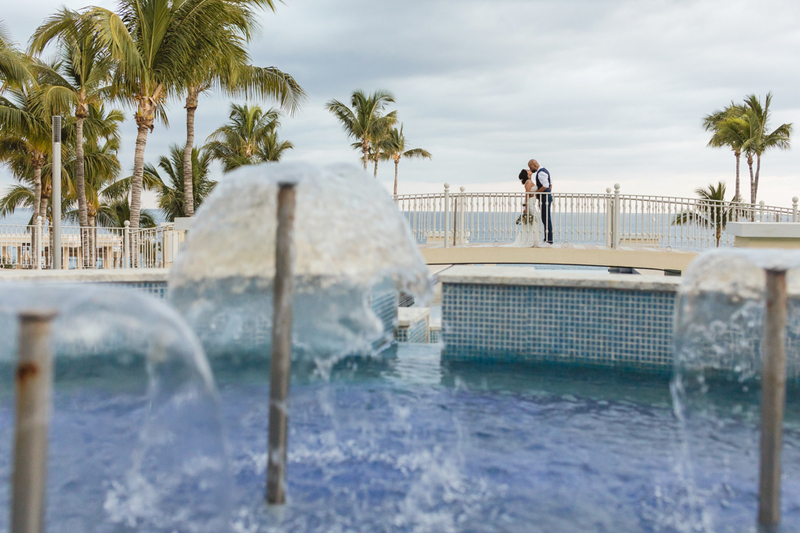 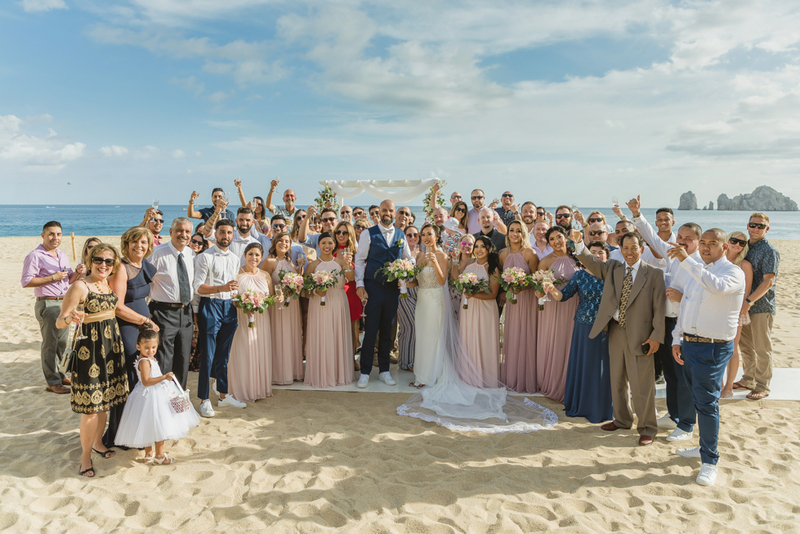 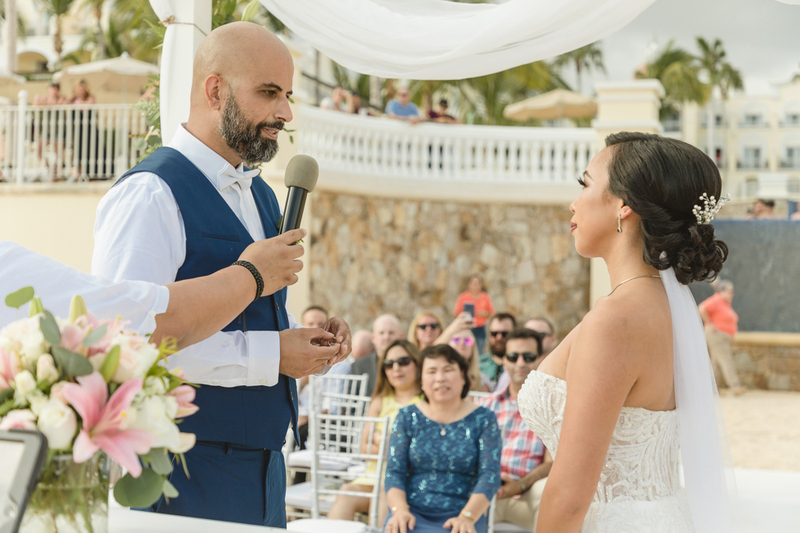 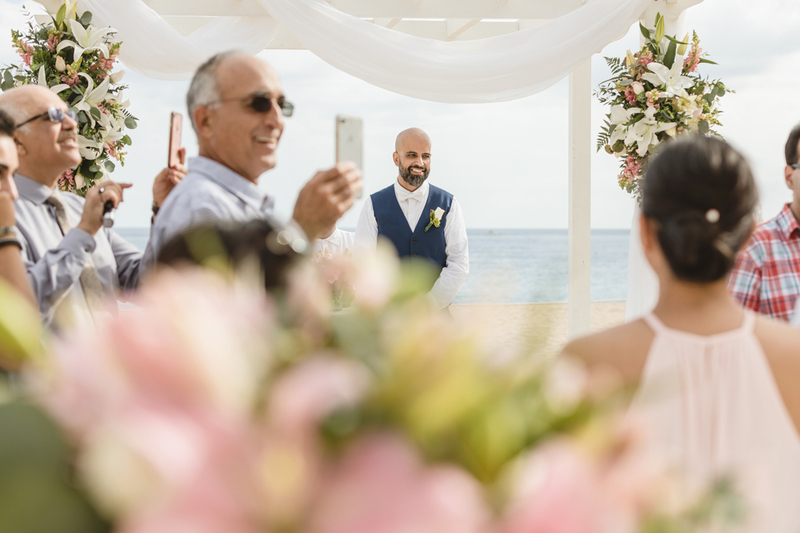 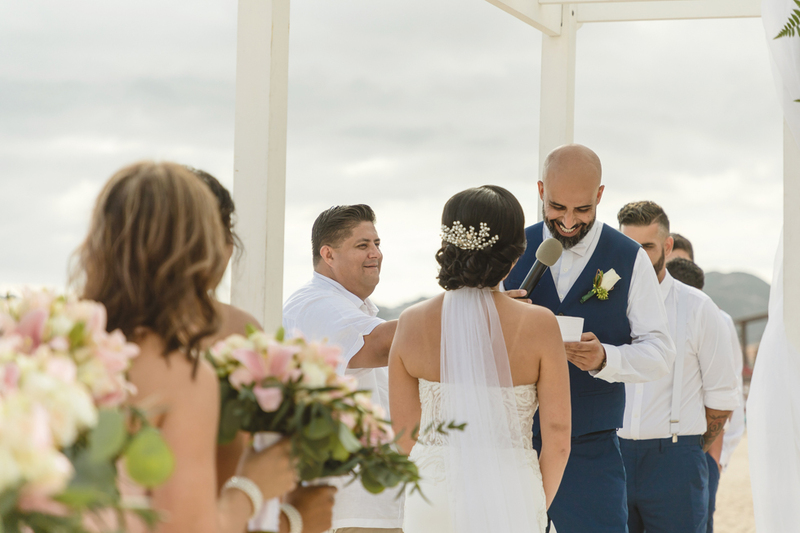 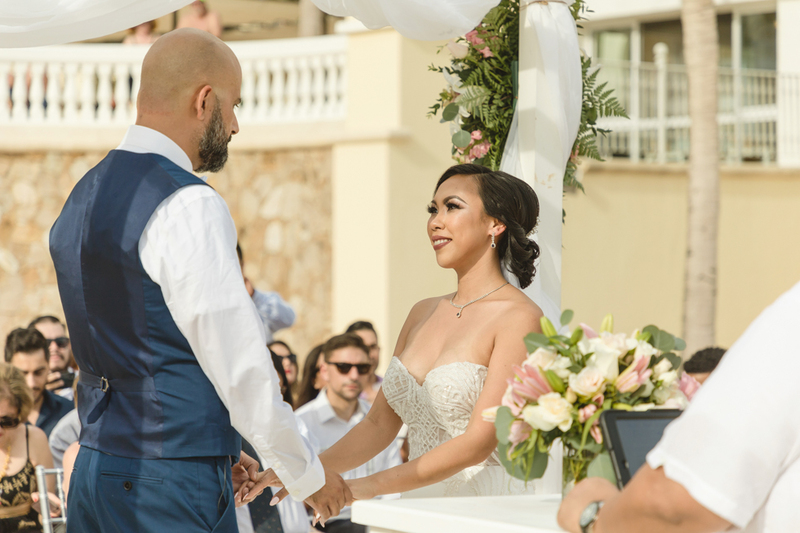 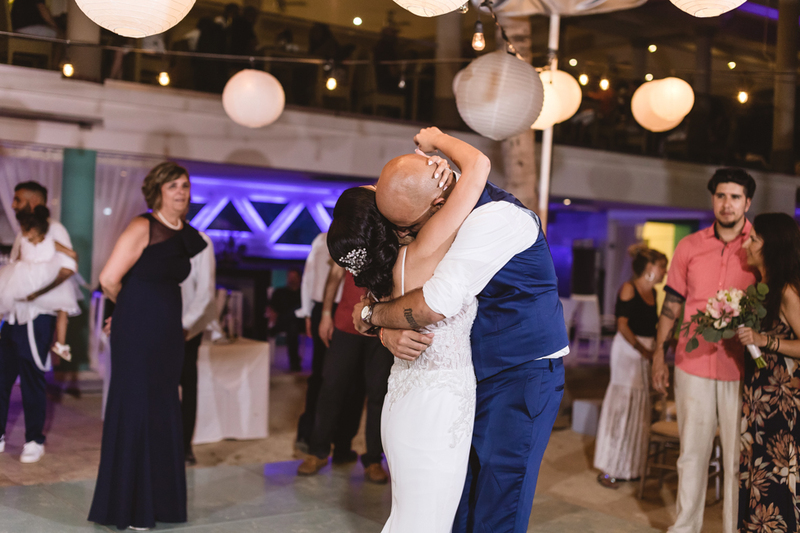 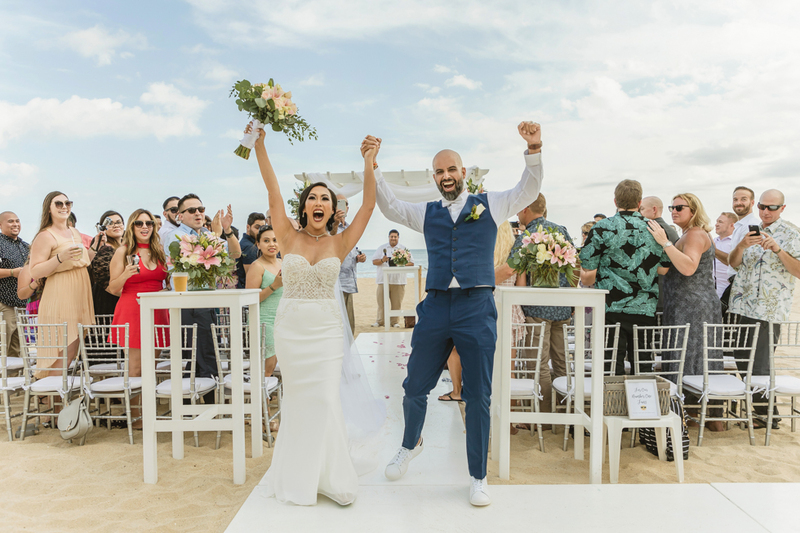 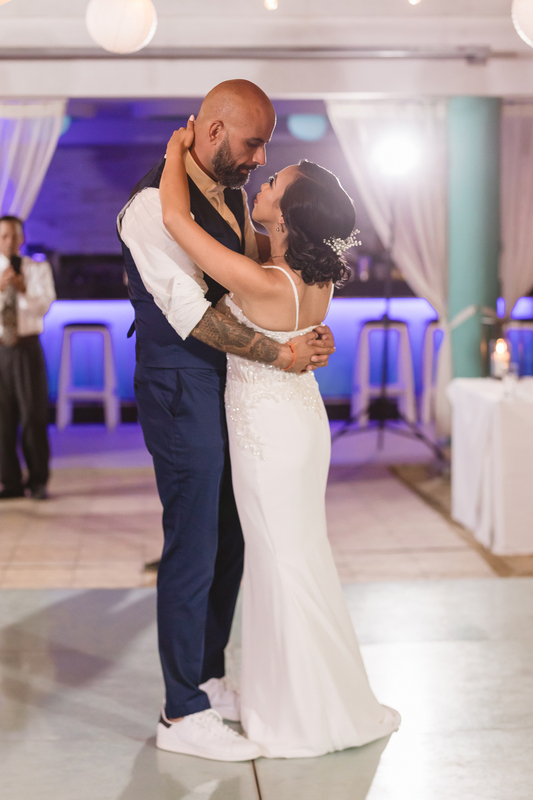 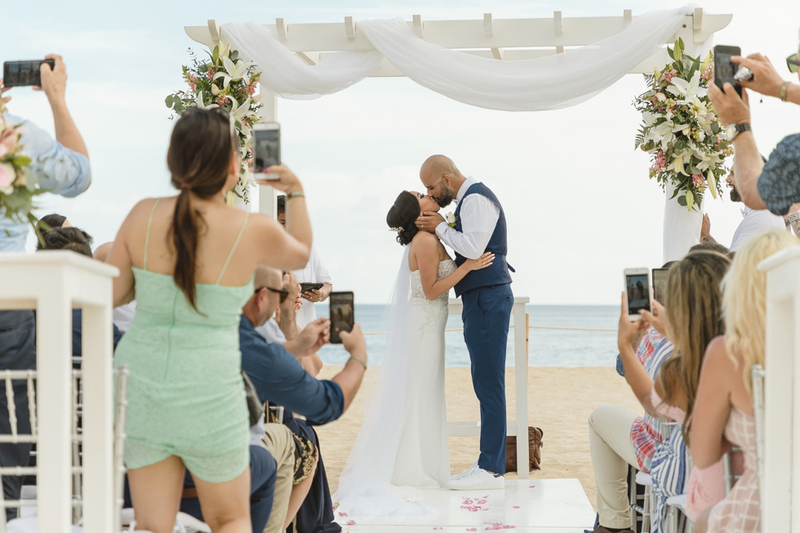 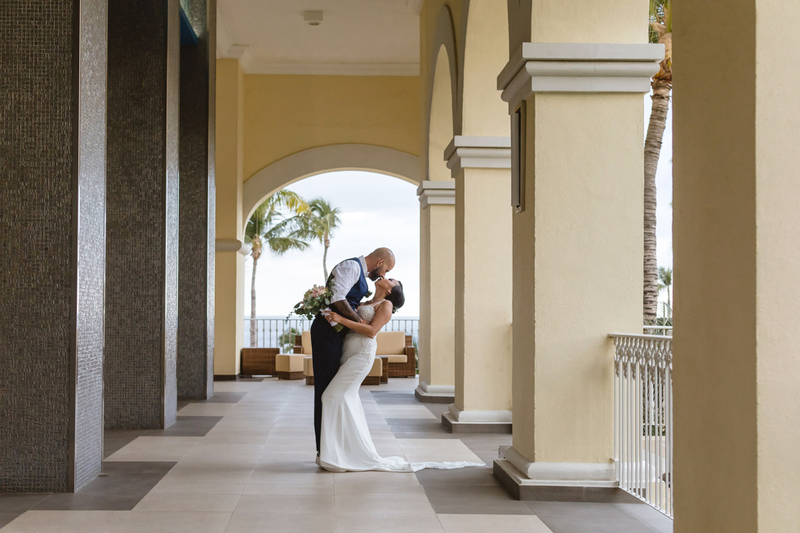 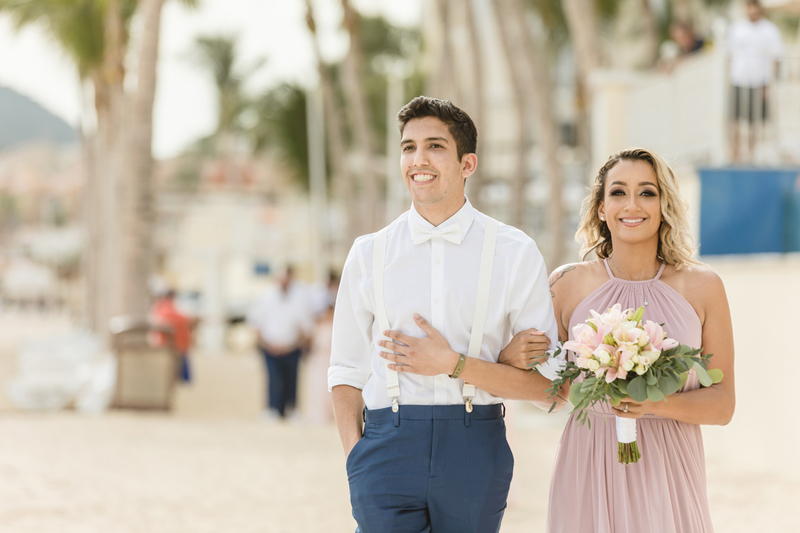 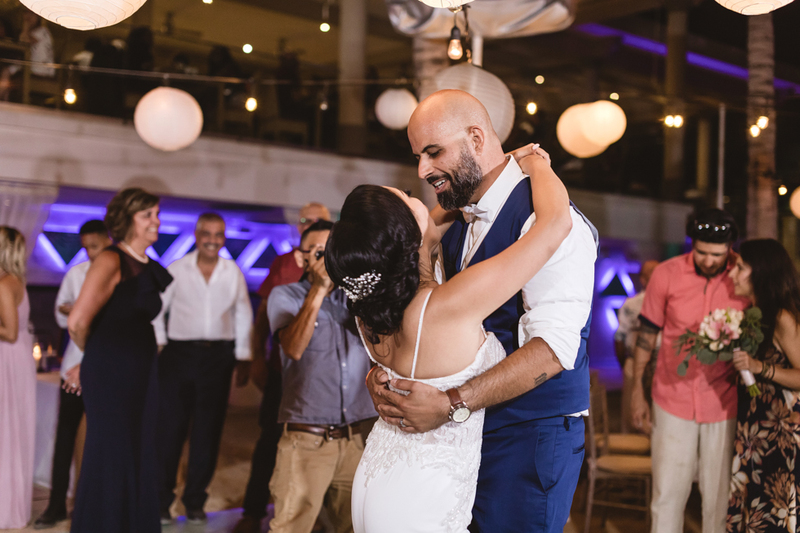 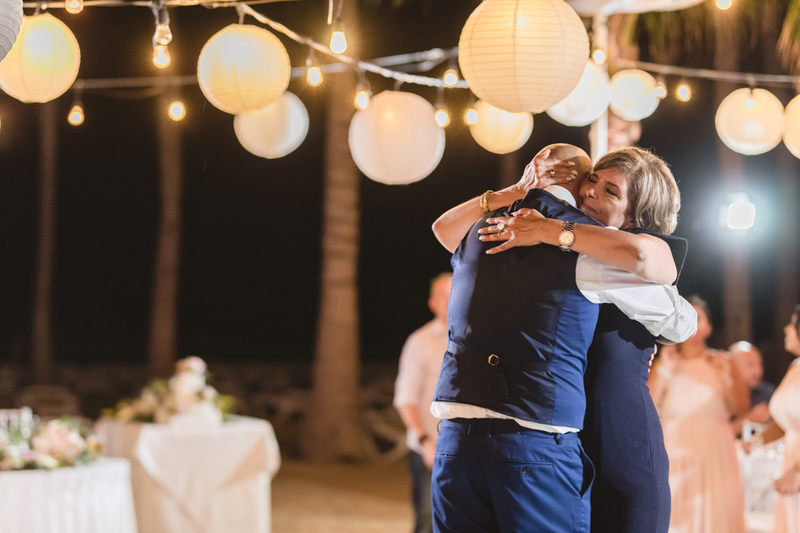 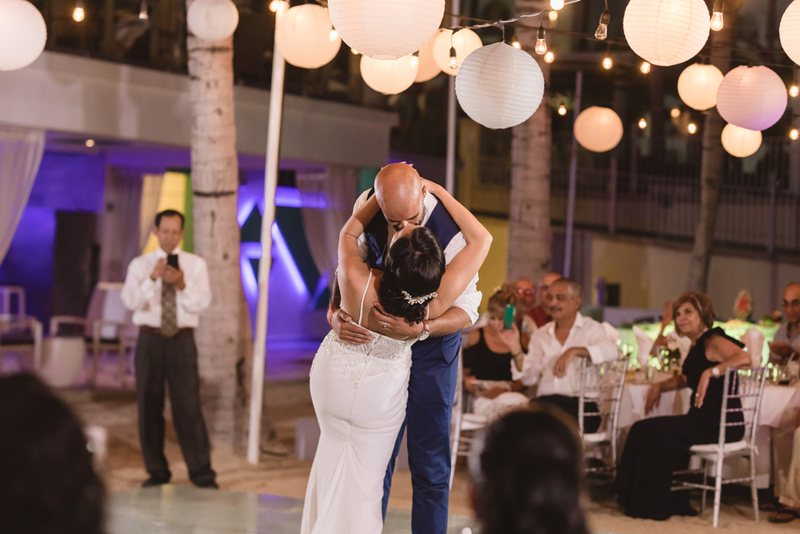 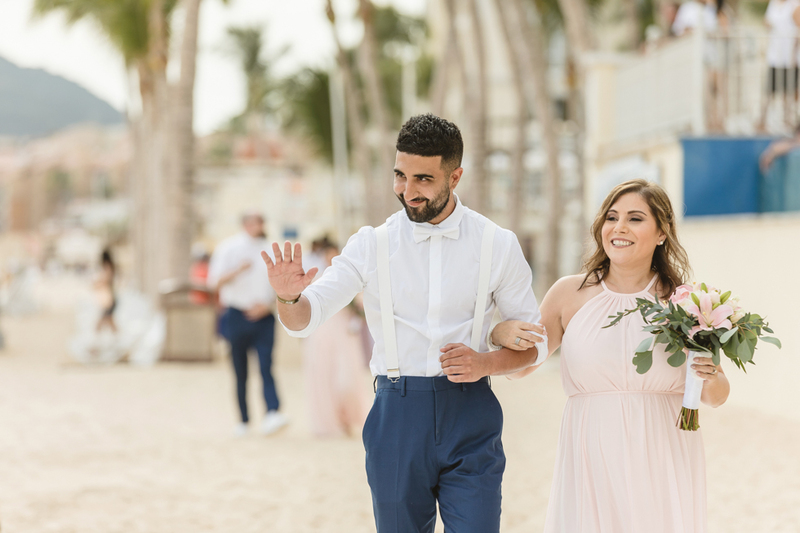 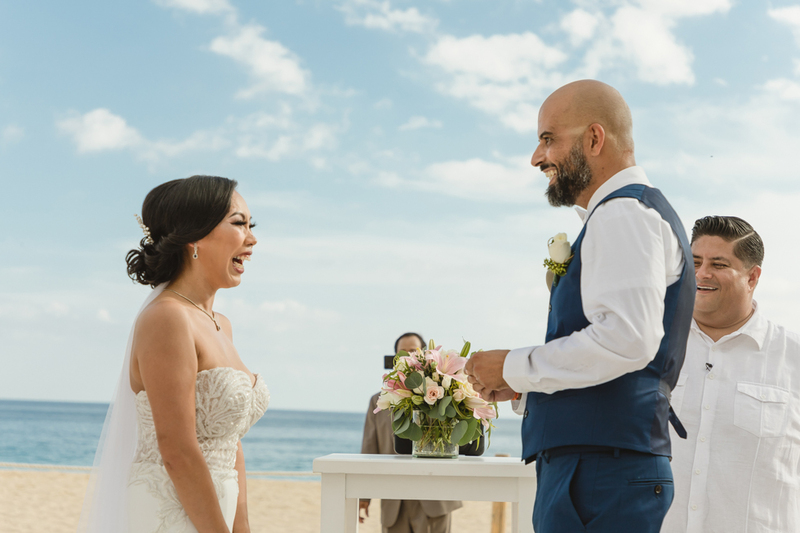 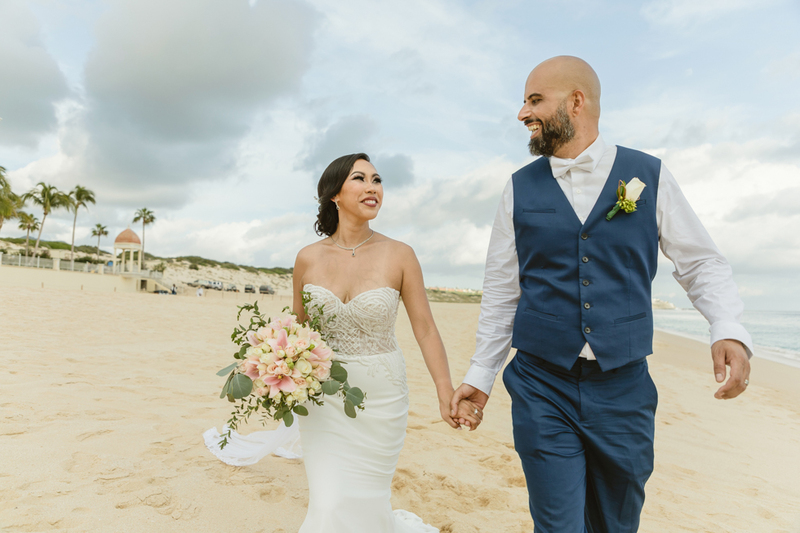 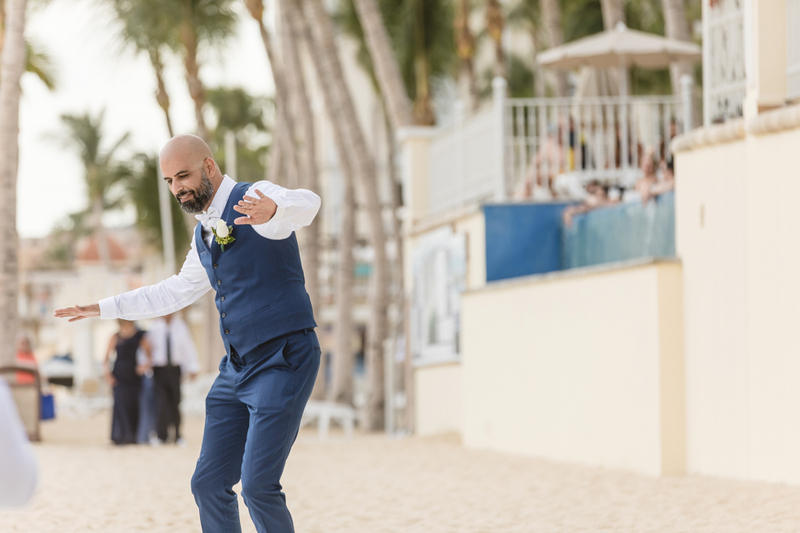 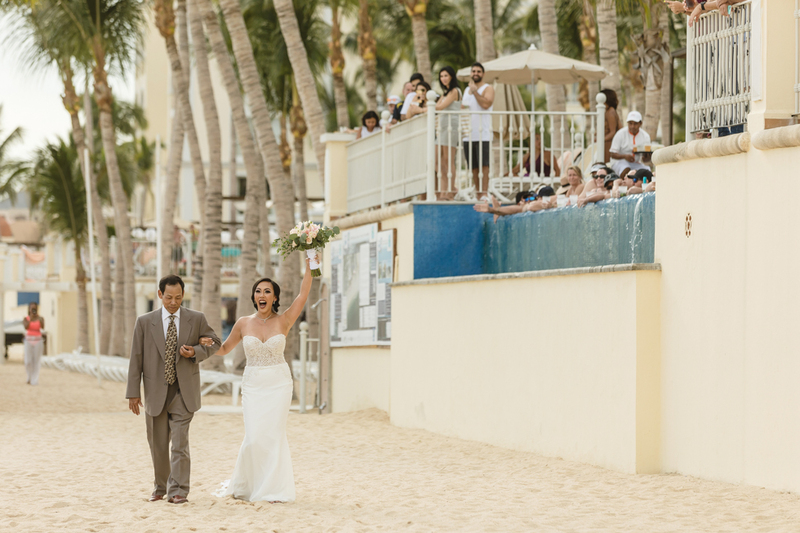 Salida and Shahram’s superb beach wedding at RIU Palace this past October is one we are very excited to share with you! 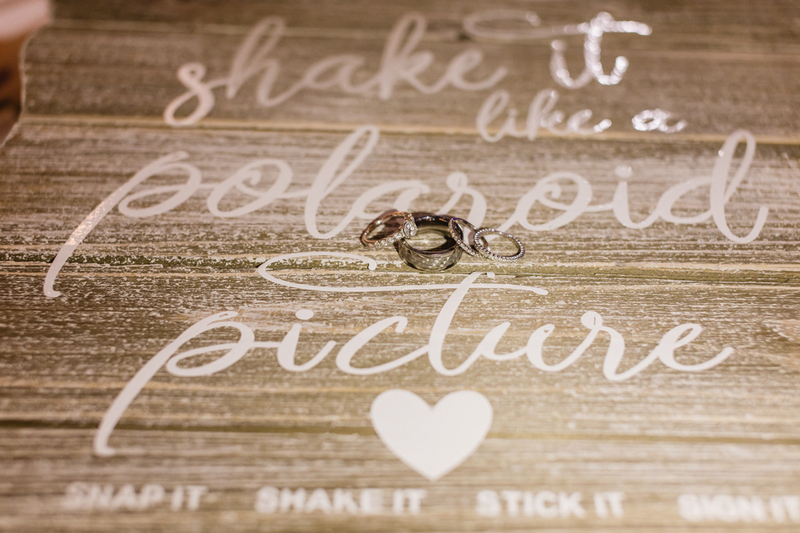 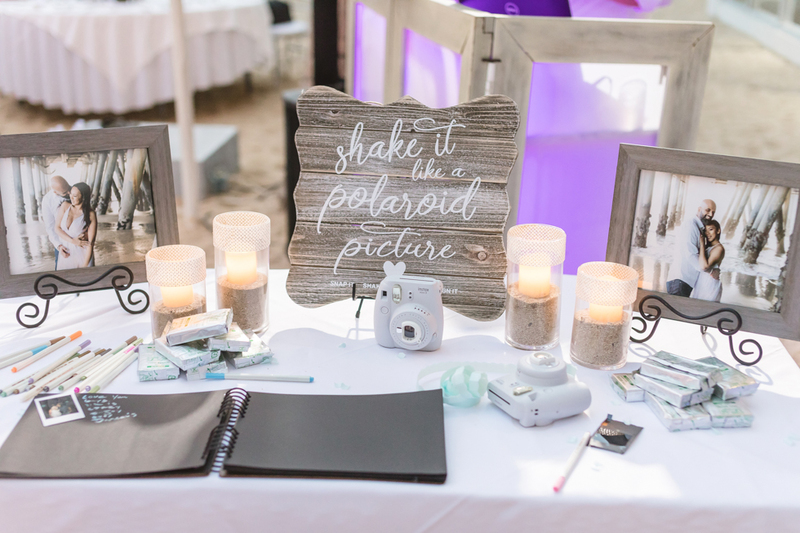 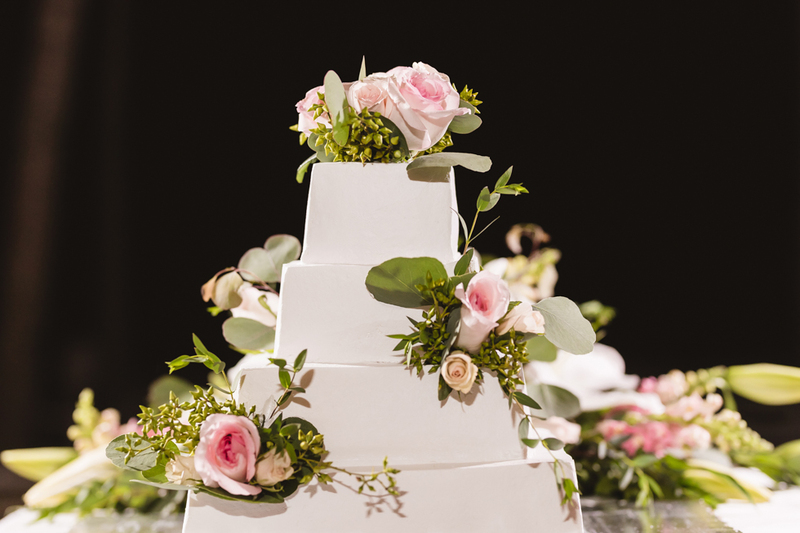 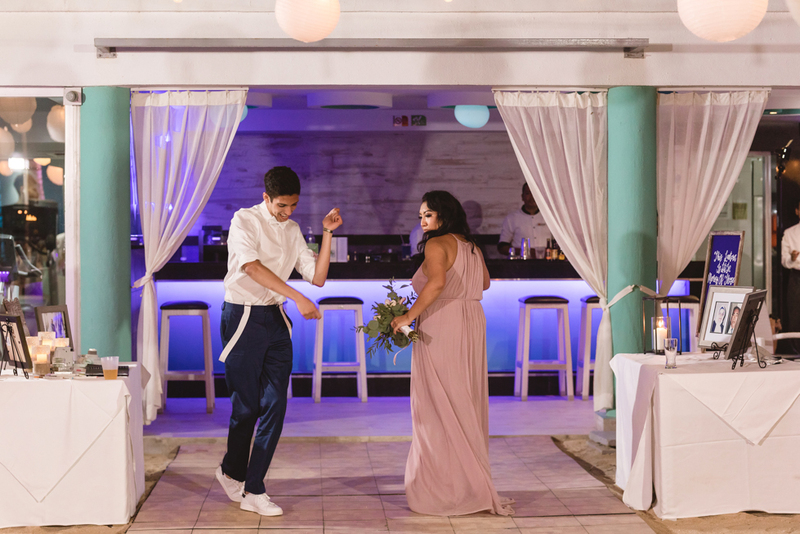 Cool, hip, trendsetters; the number of adjectives we could use to describe Salida and Shahram are endless, and they put every bit of themselves into planning a fun and funky wedding event that is sure to inspire many a newly engaged couple. 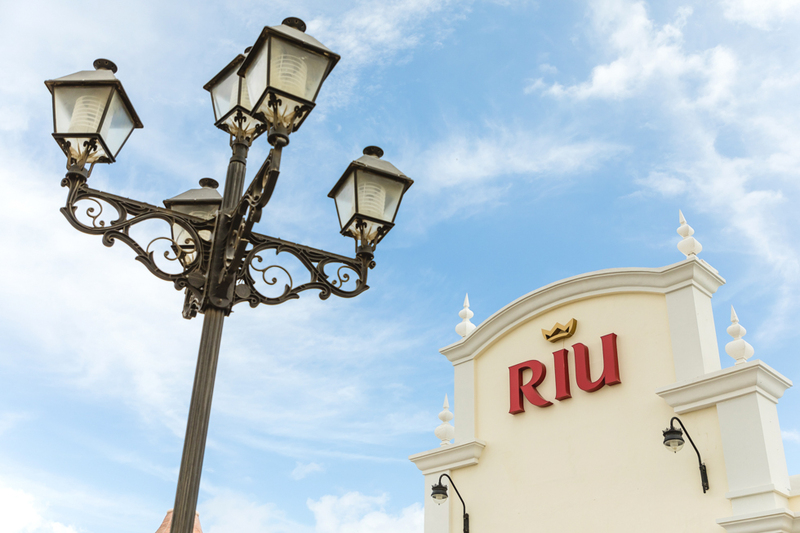 RIU Palace is one of Cabo’s larger all-inclusive resorts, situated just outside of the Cabo San Lucas downtown and with views across the Sea of Cortez. 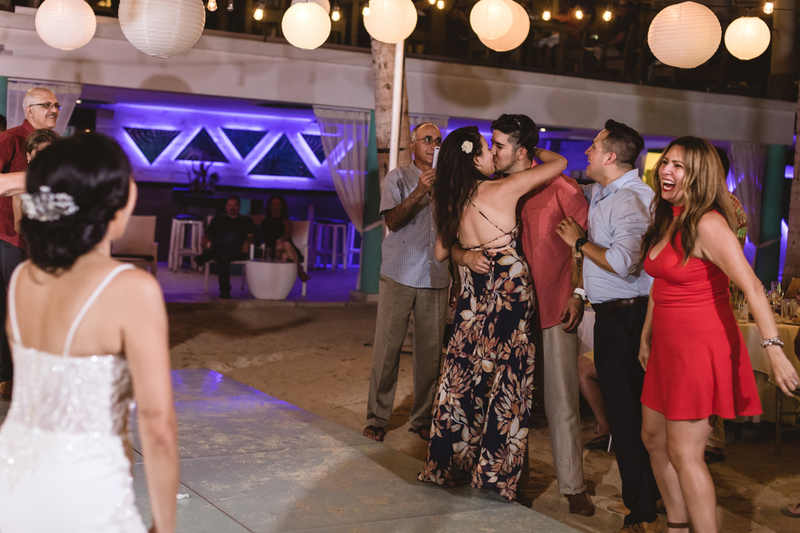 A short walk from bars, clubs and restaurants, and with a very extensive all-inclusive program to boot, the resort is popular amongst the younger crowd and seasoned travelers alike. 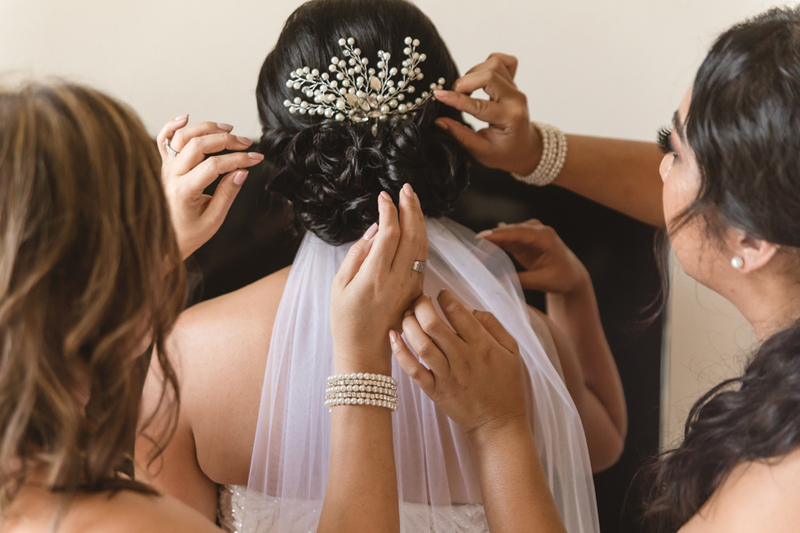 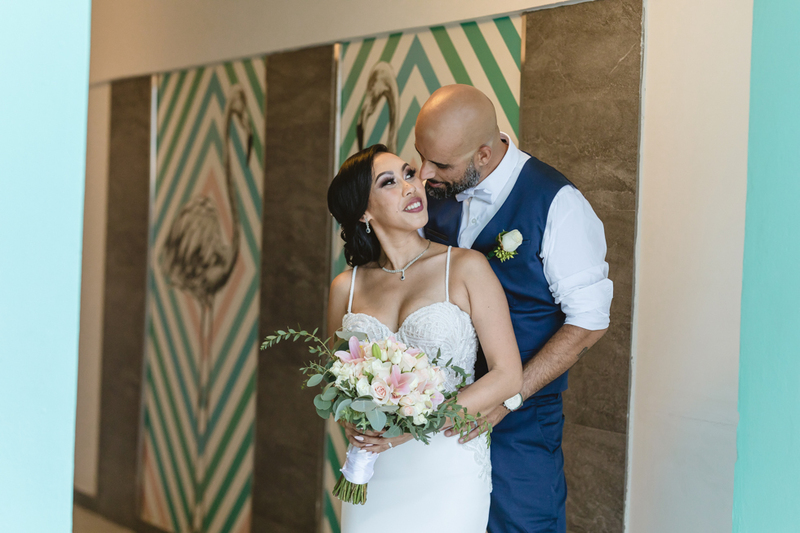 Hotel coordinator Lupita Paez was on hand to help Salida plan her special day, and we were lucky enough to shoot both photo and video. 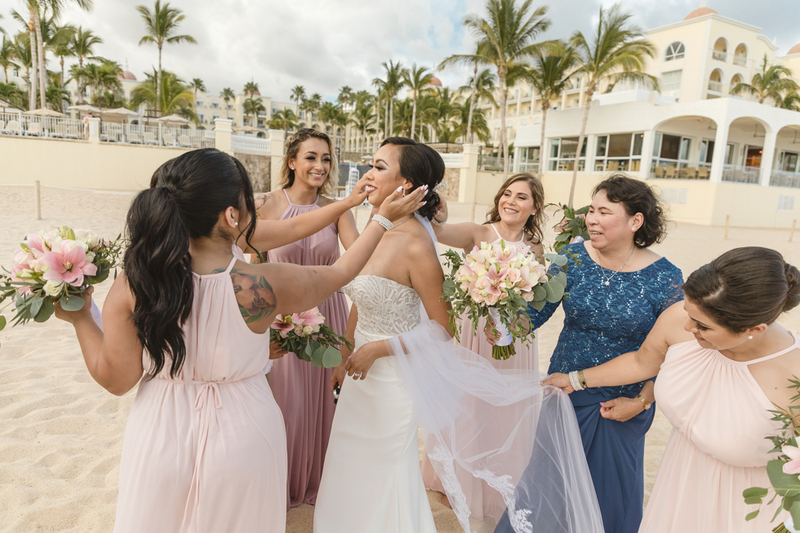 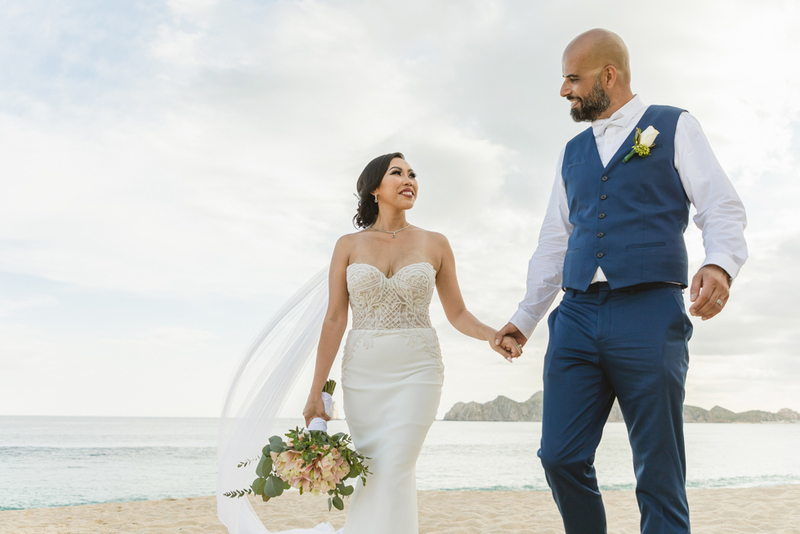 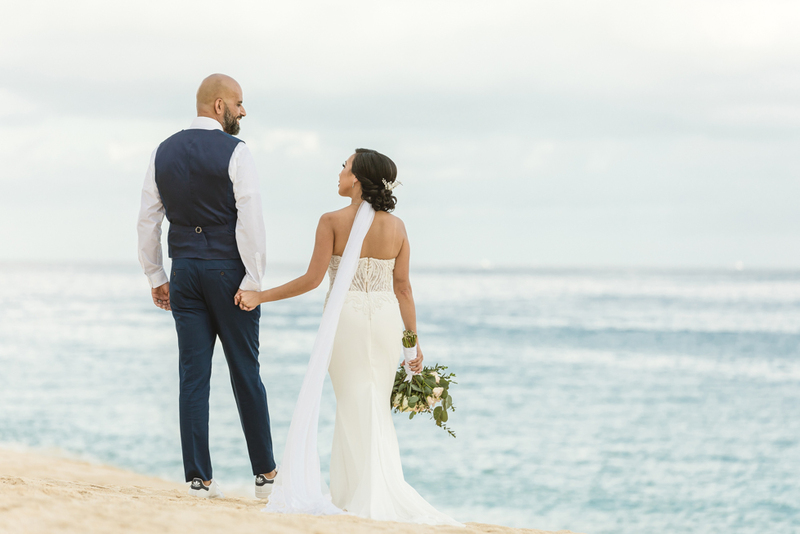 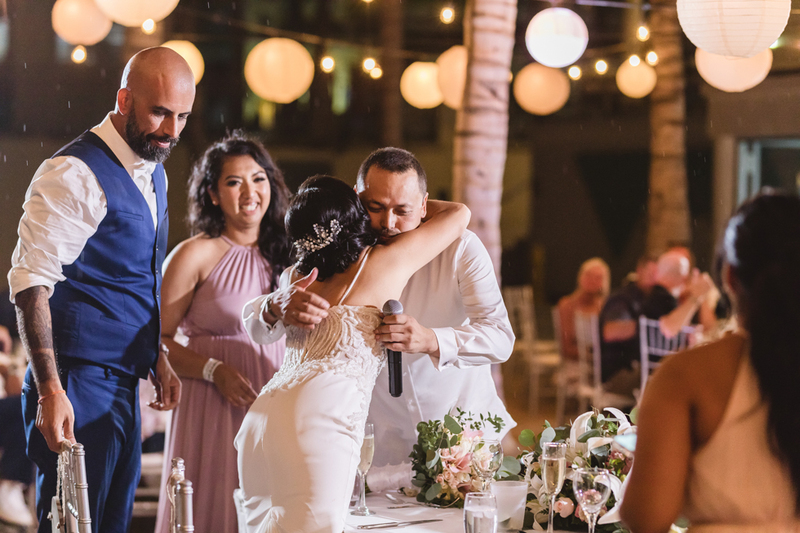 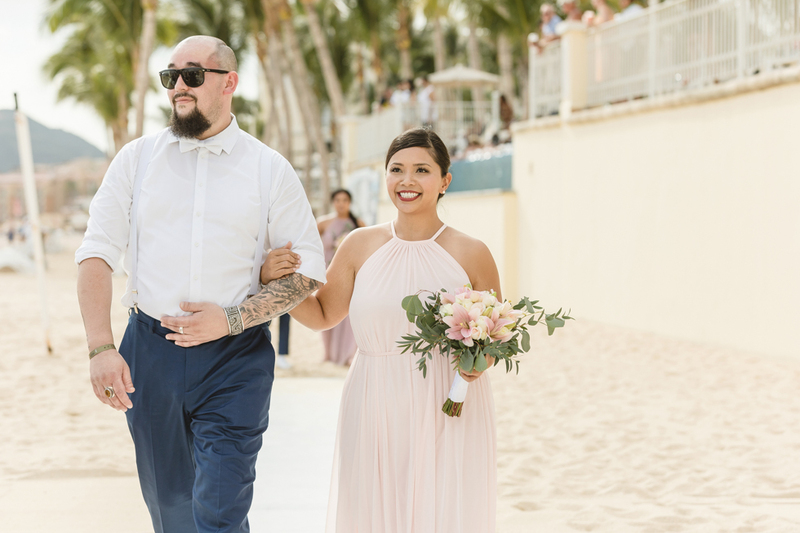 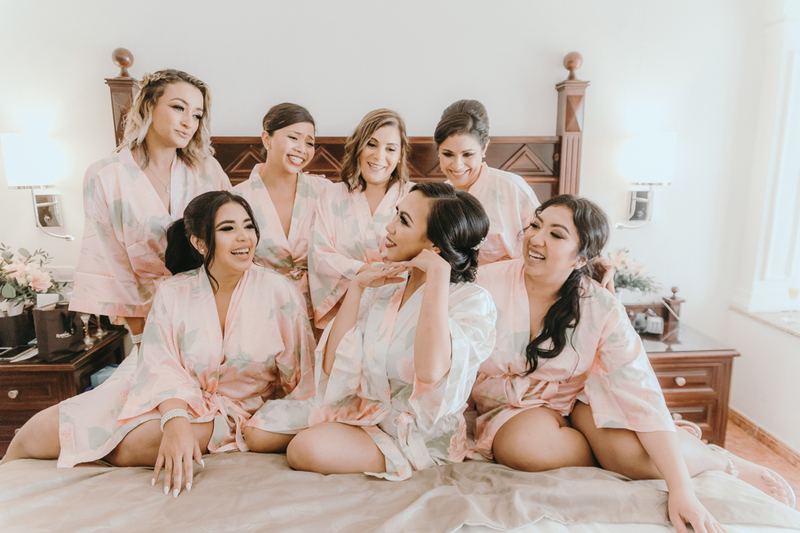 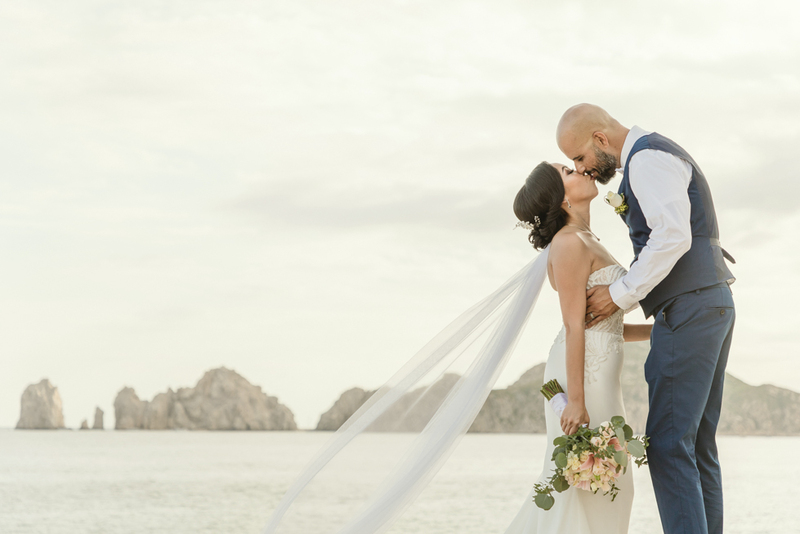 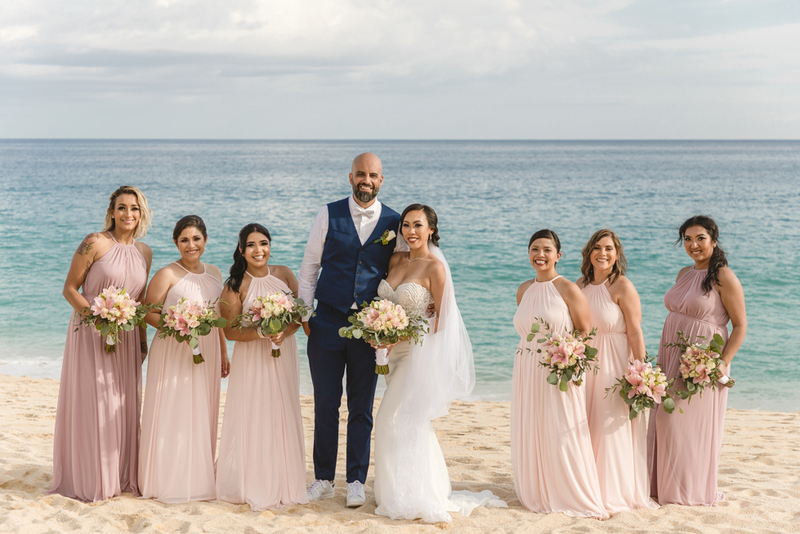 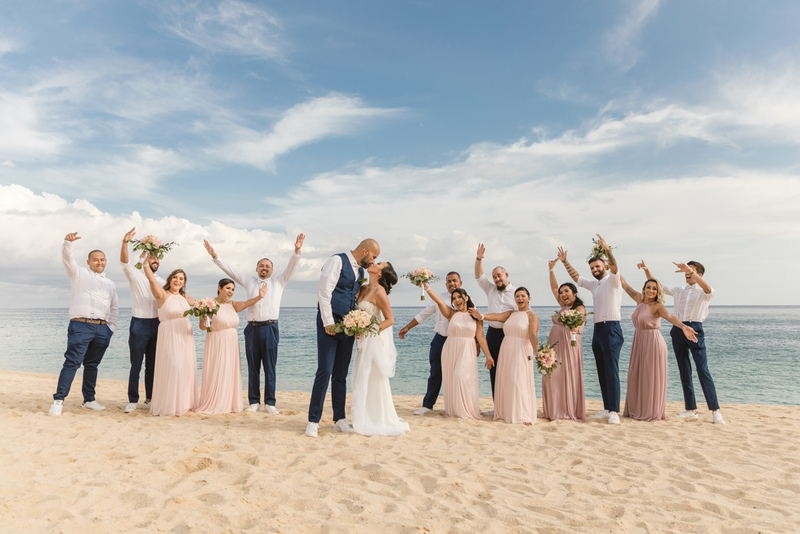 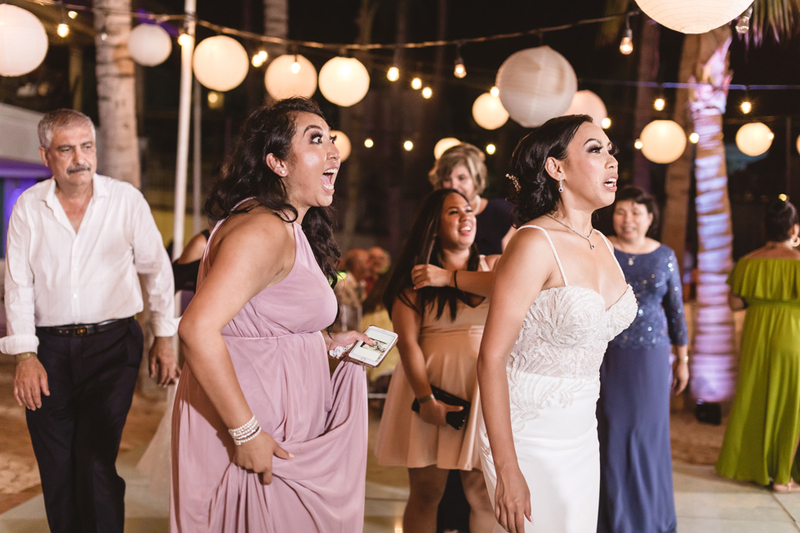 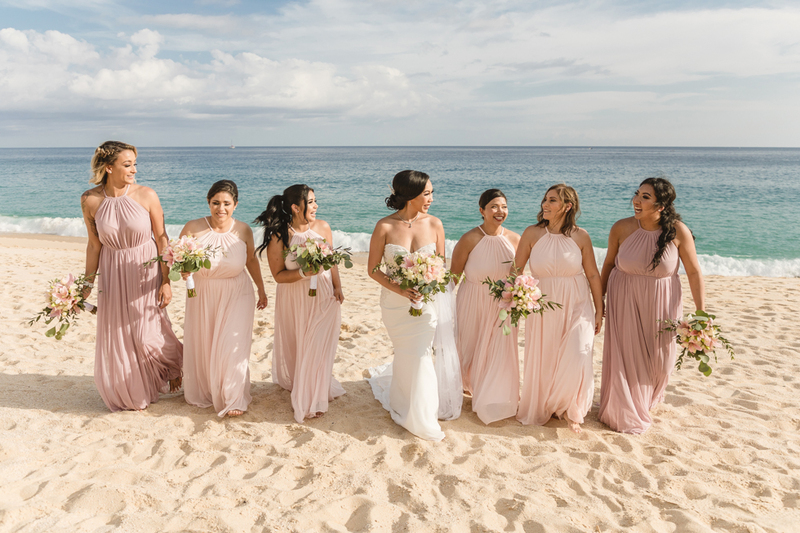 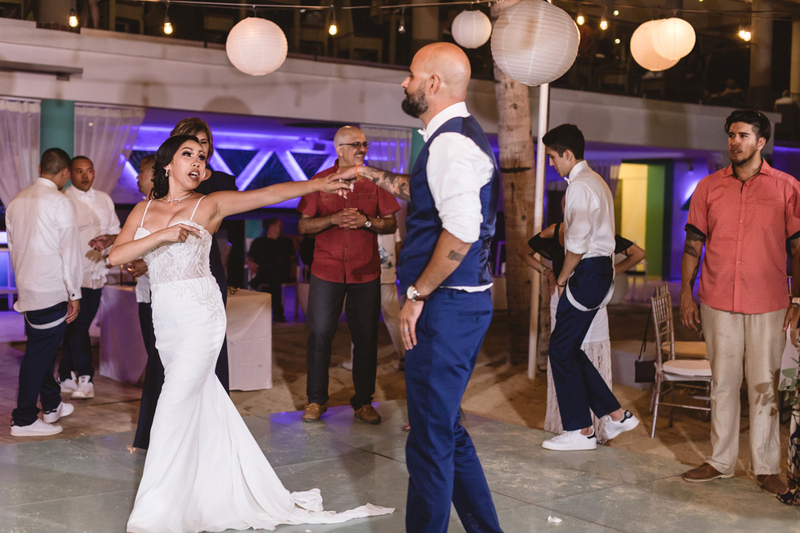 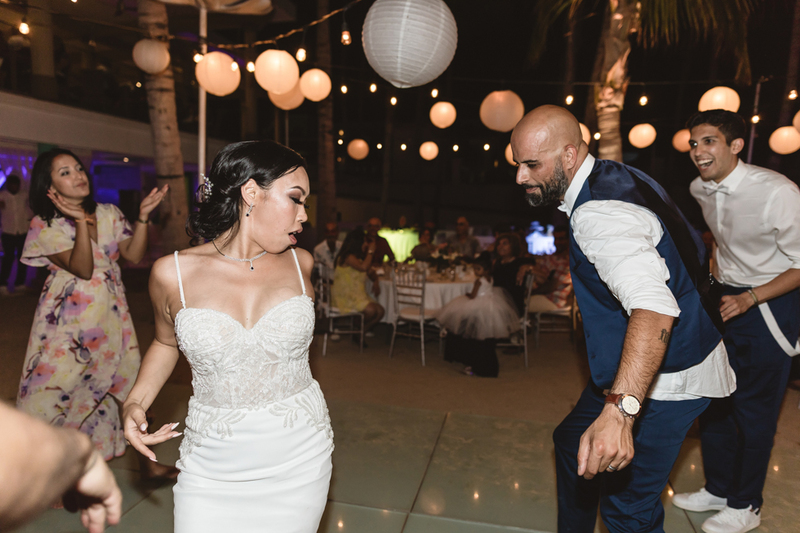 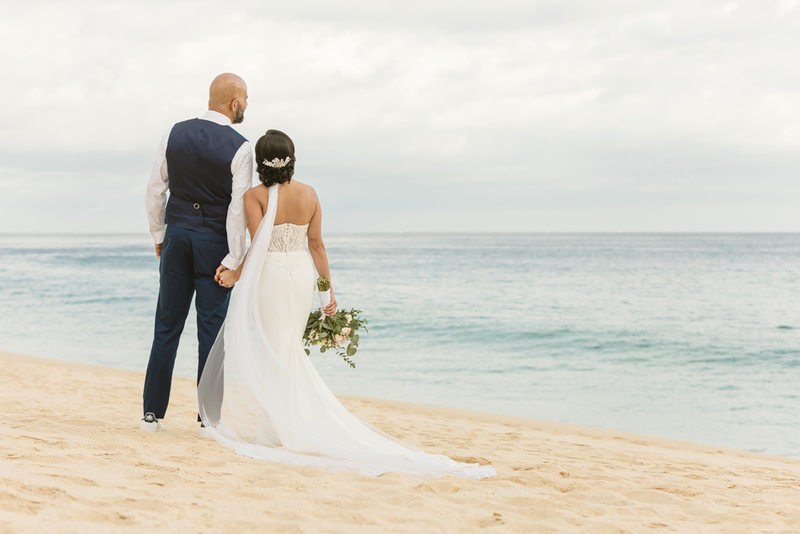 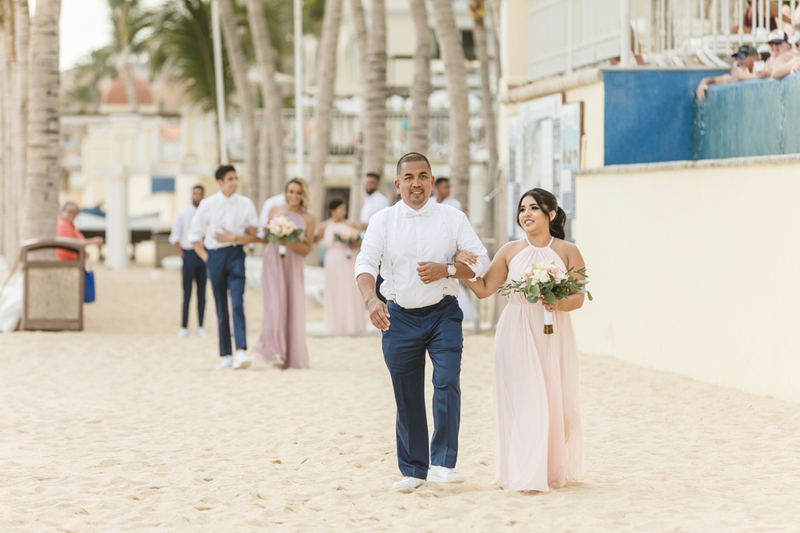 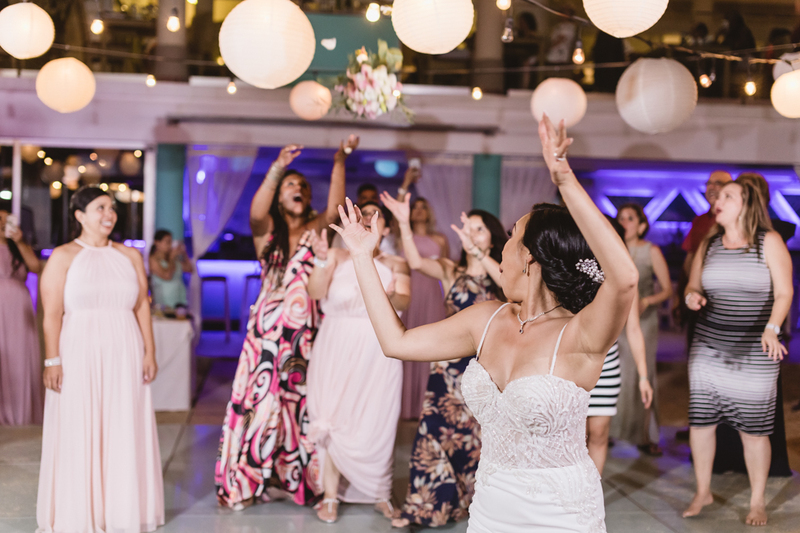 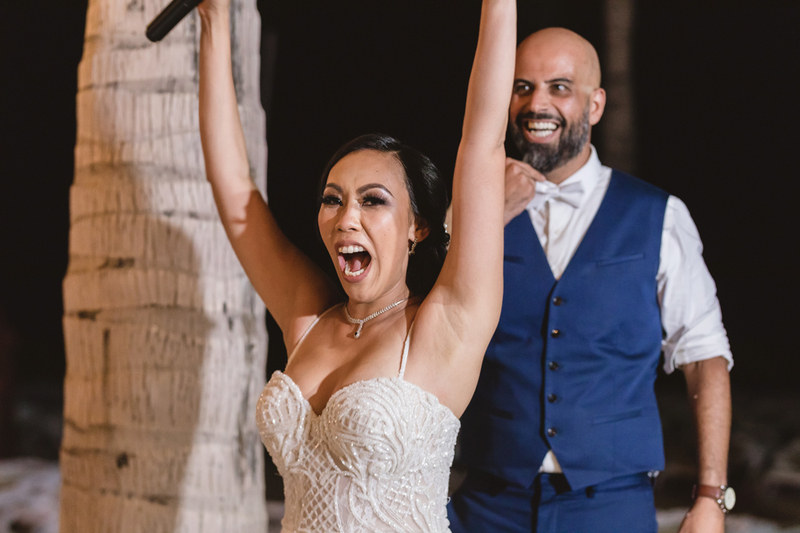 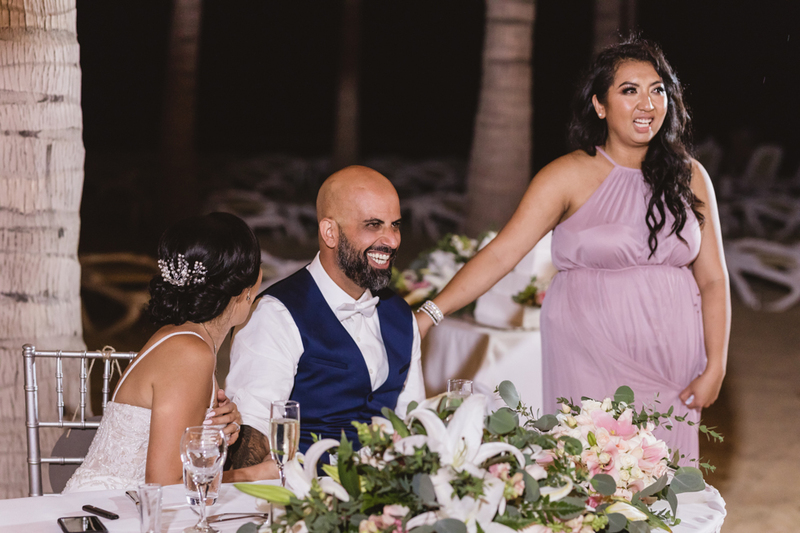 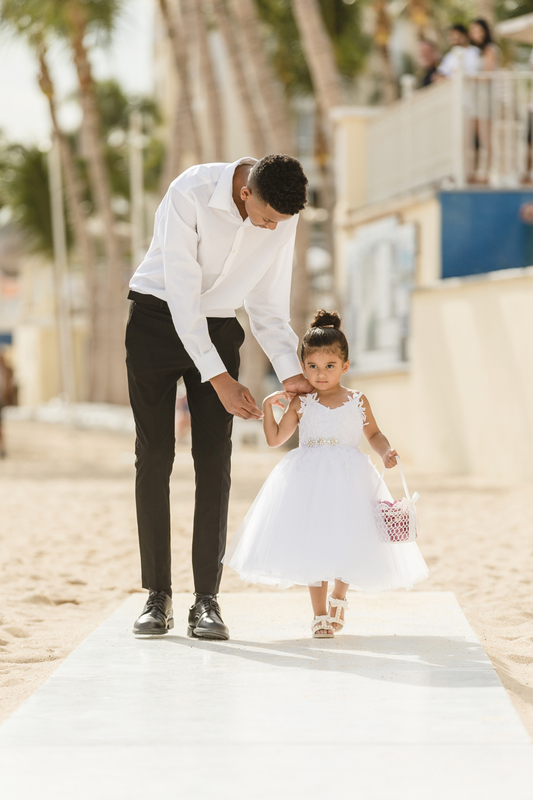 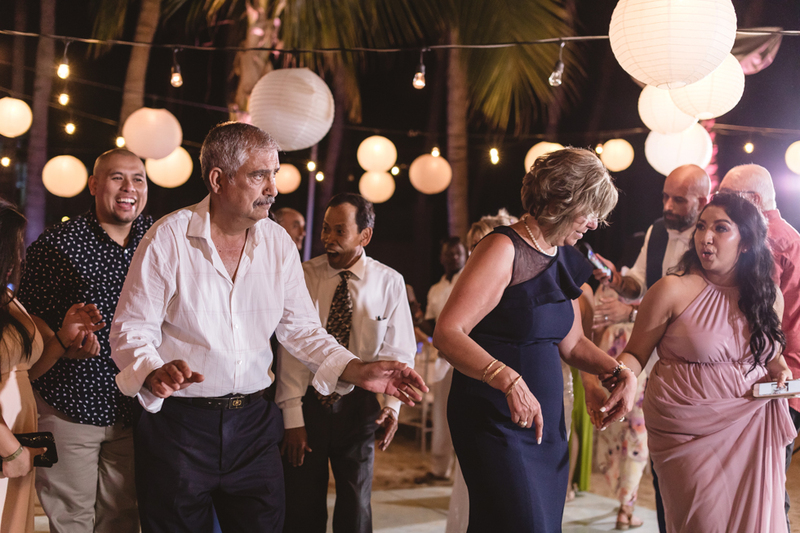 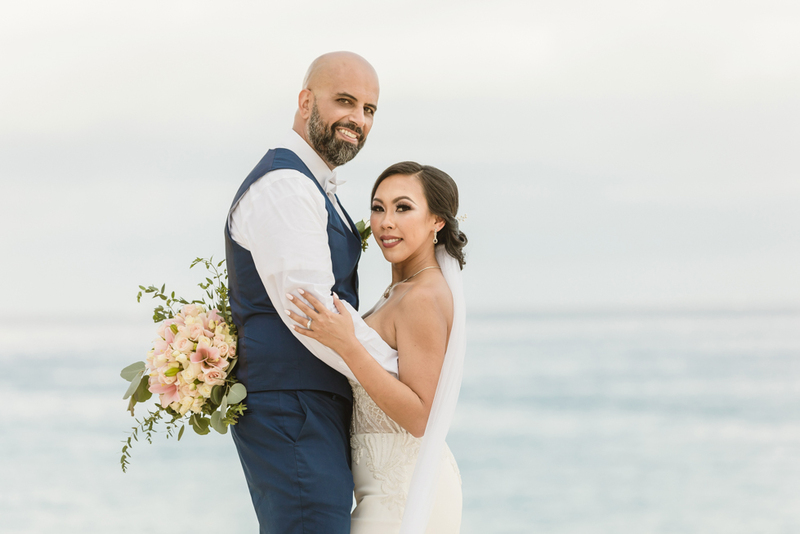 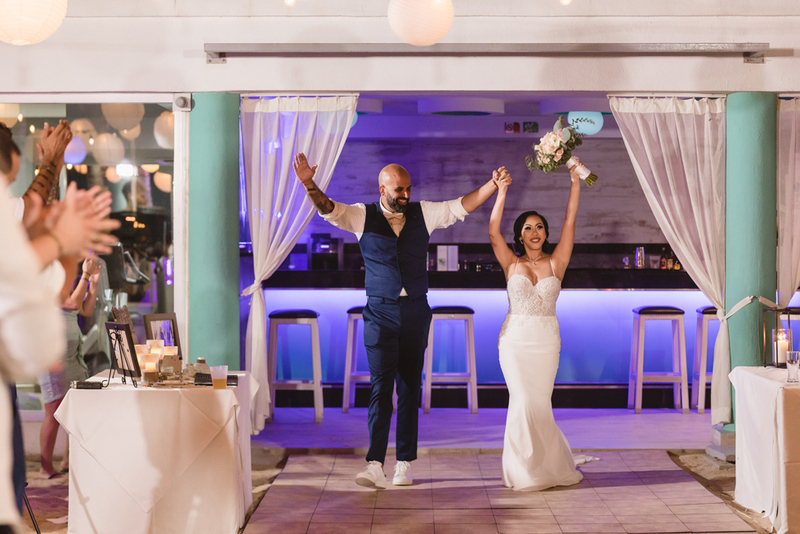 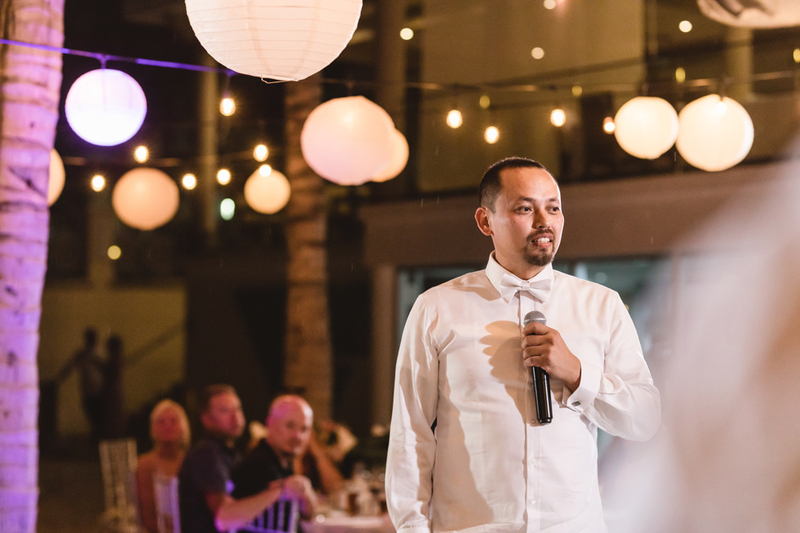 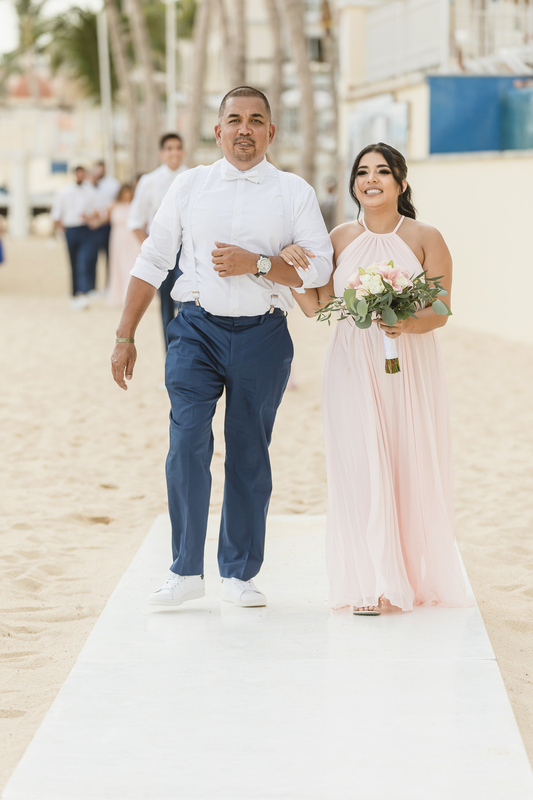 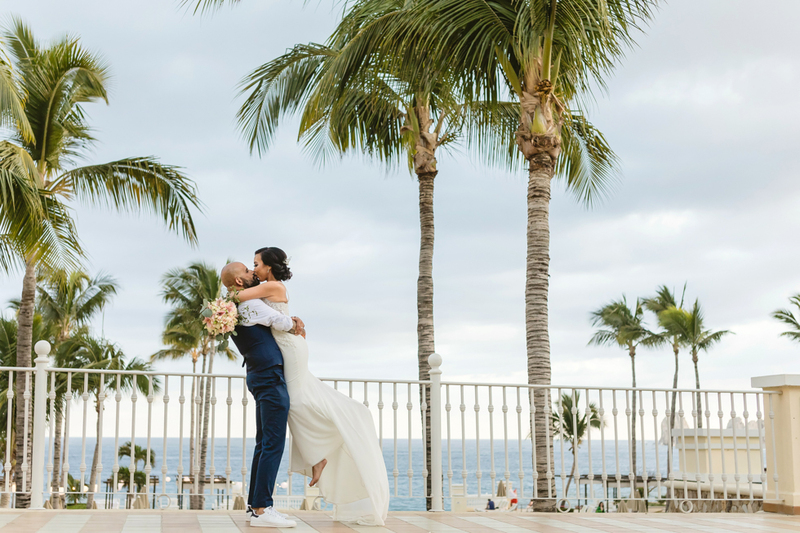 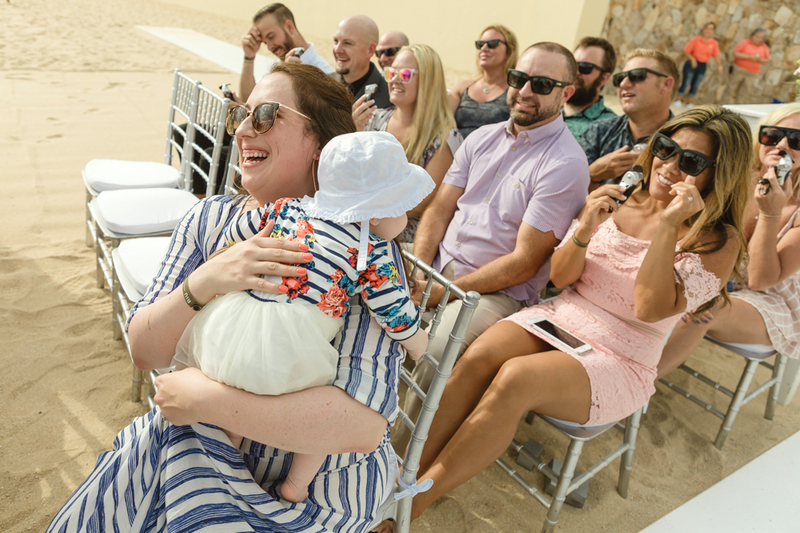 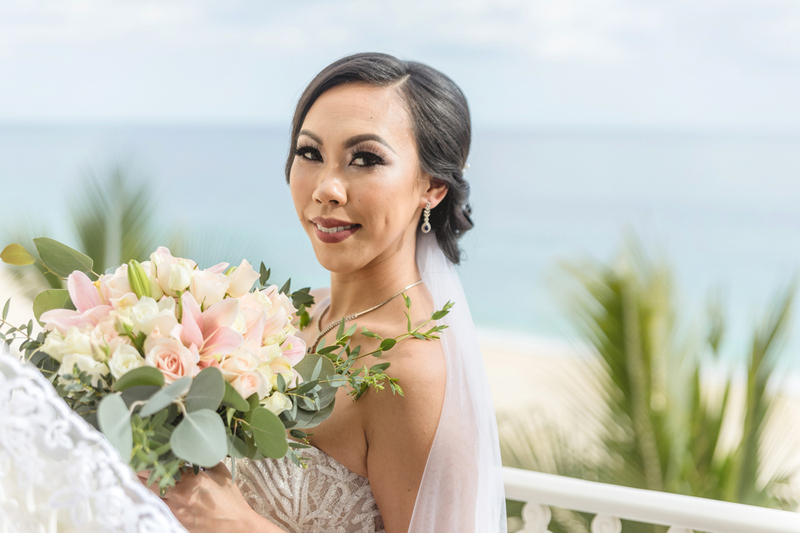 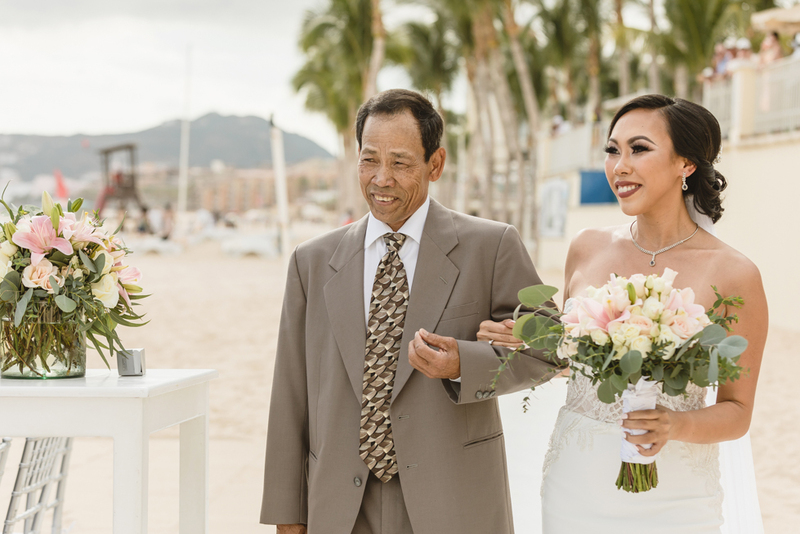 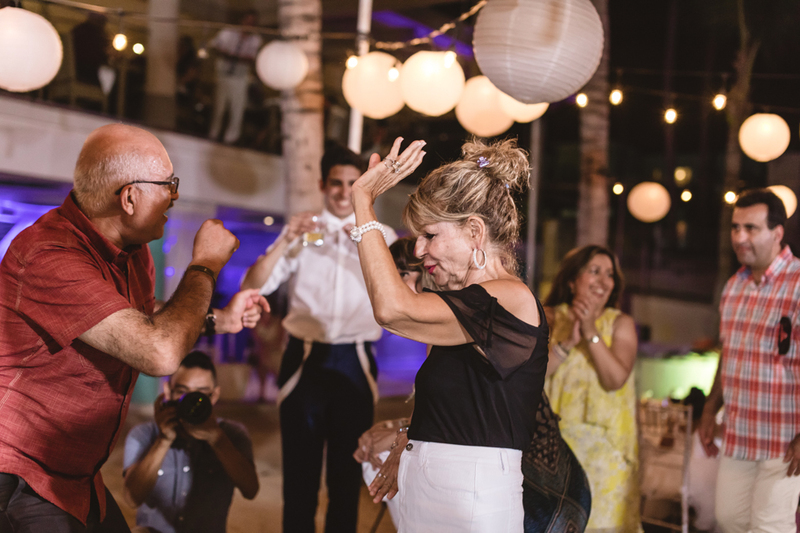 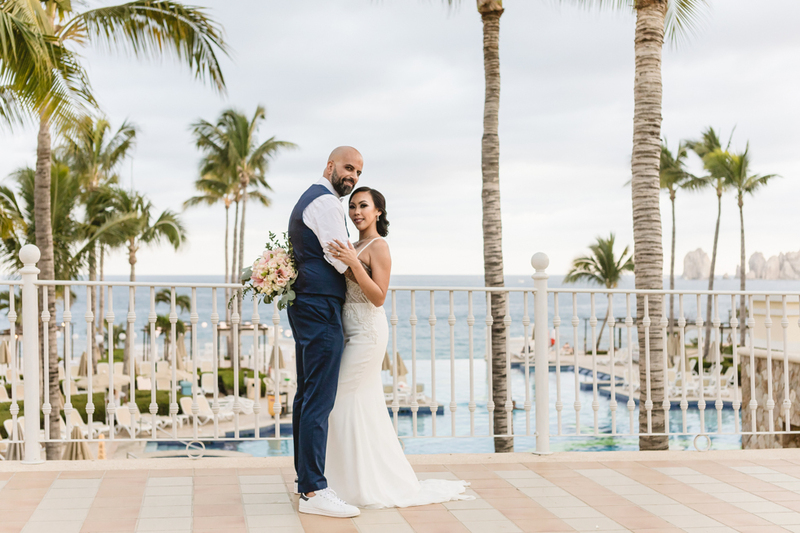 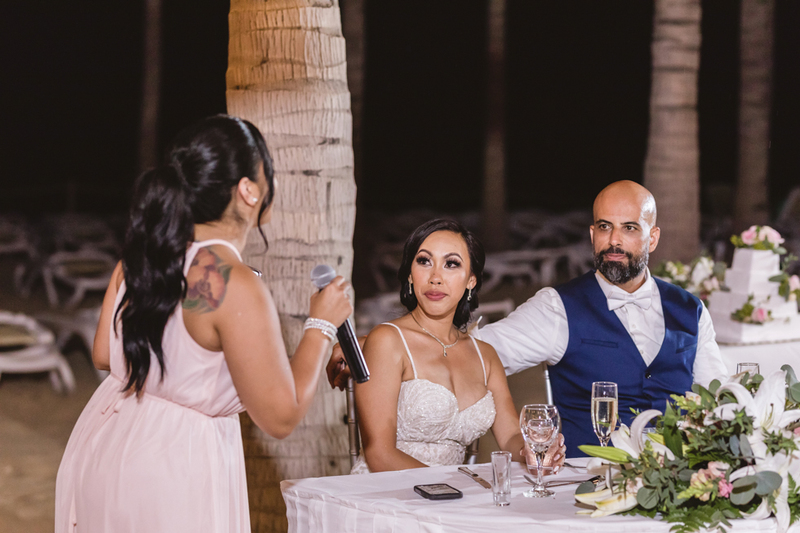 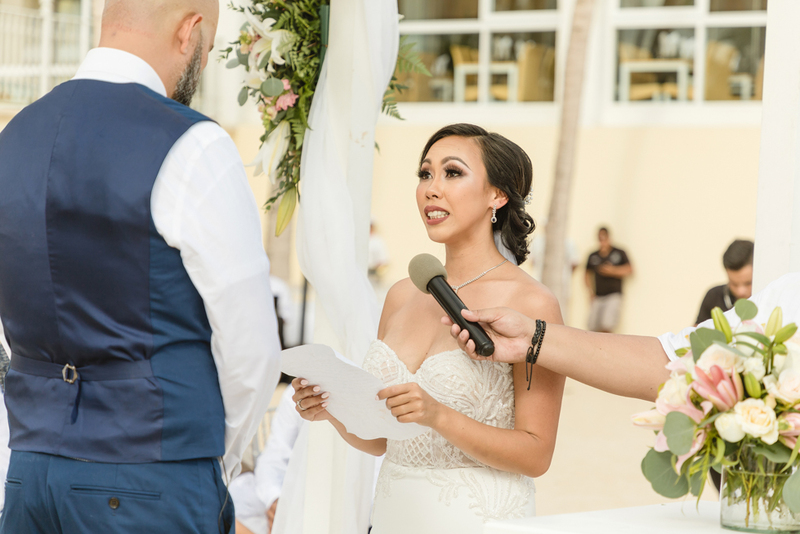 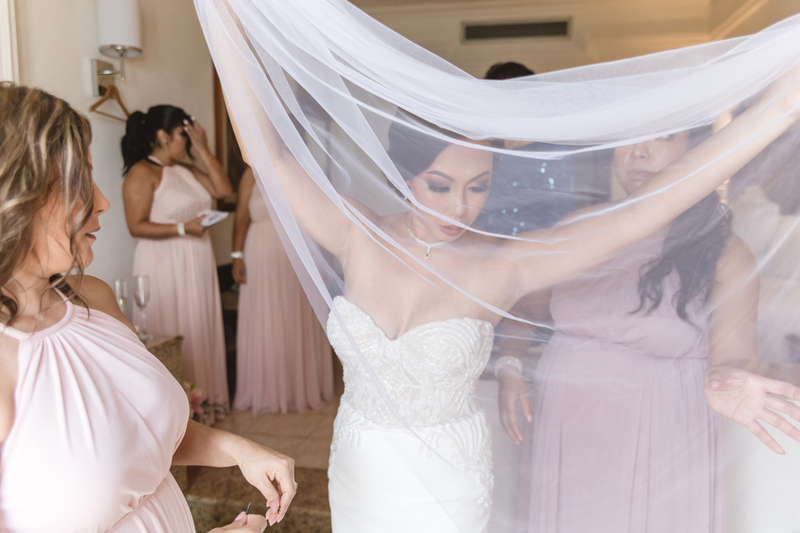 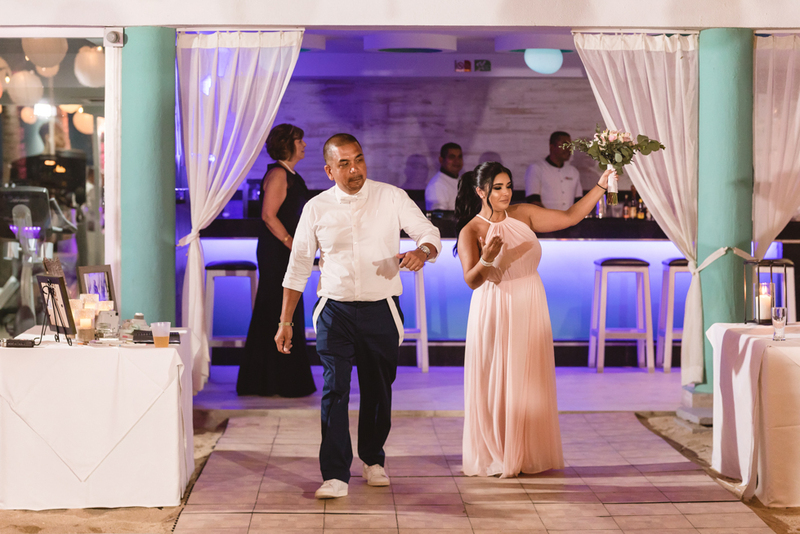 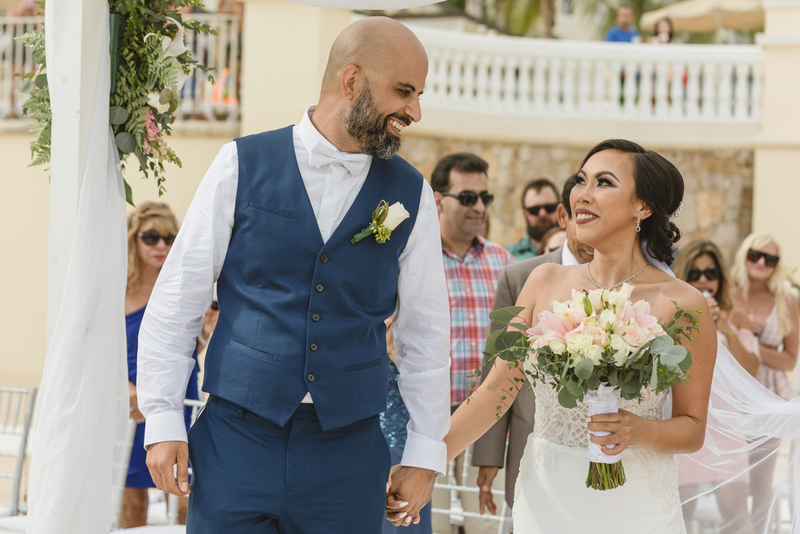 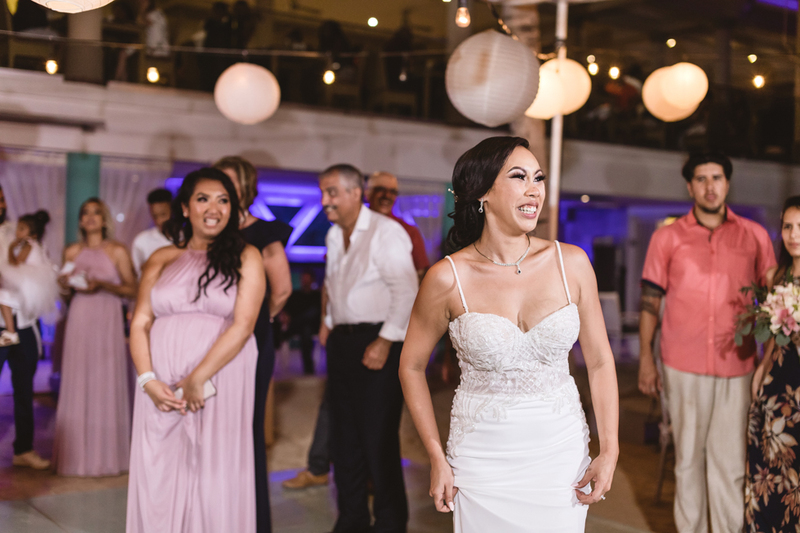 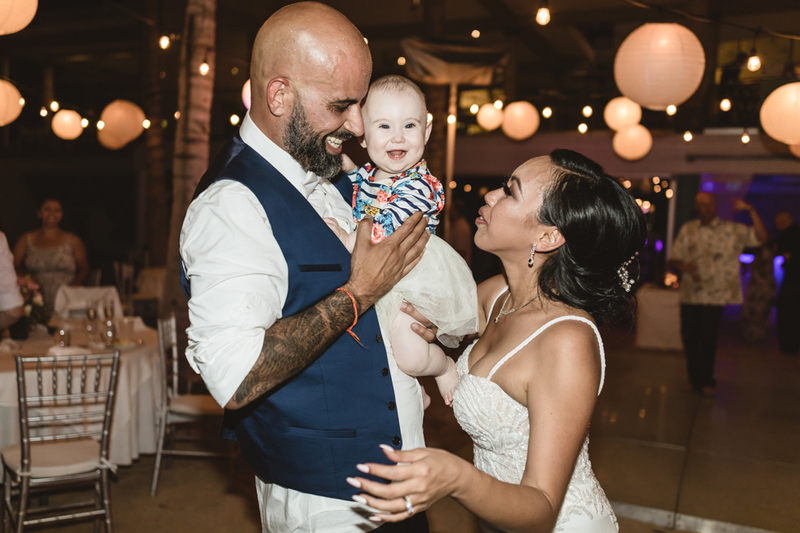 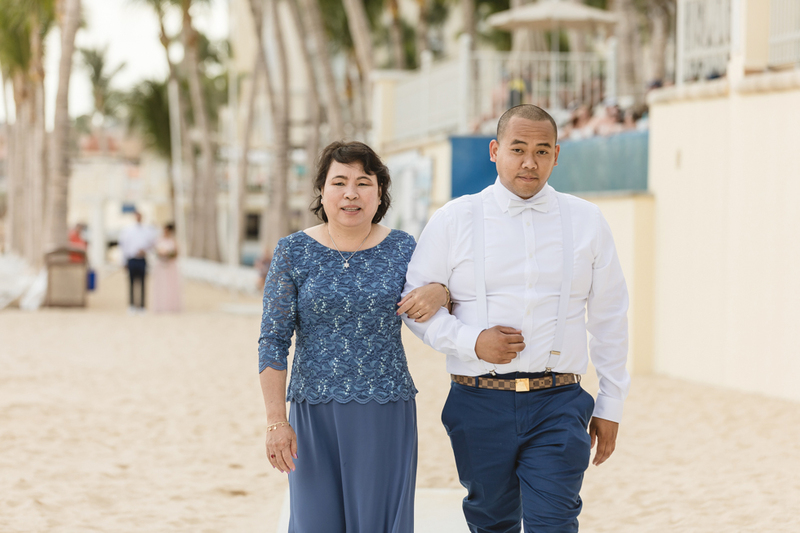 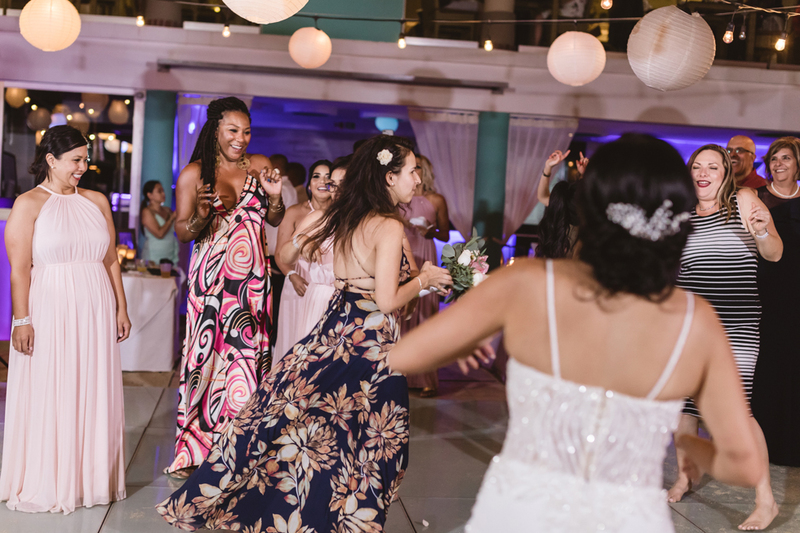 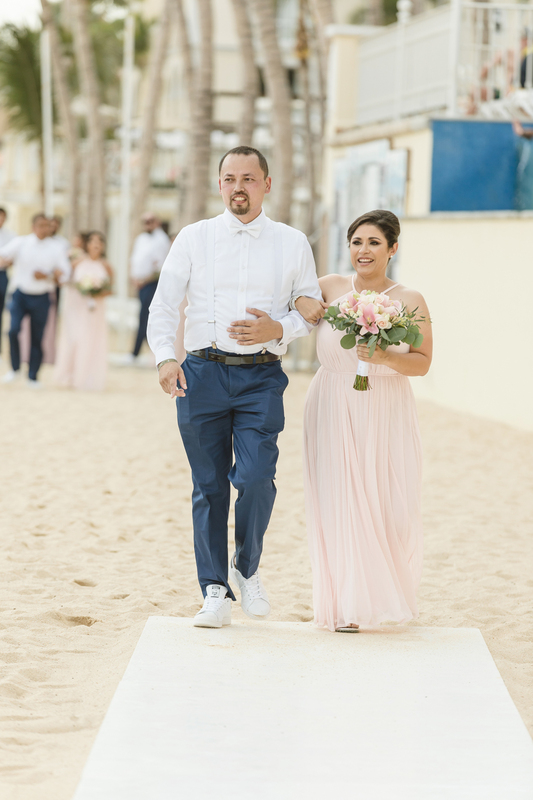 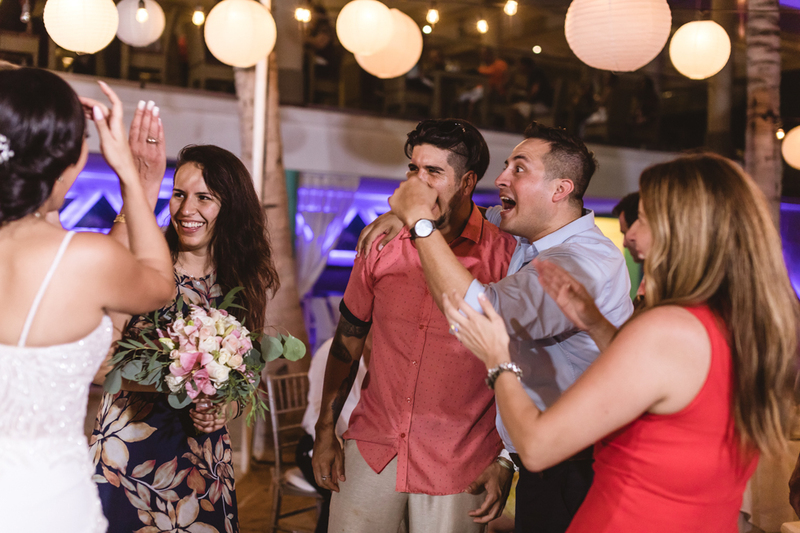 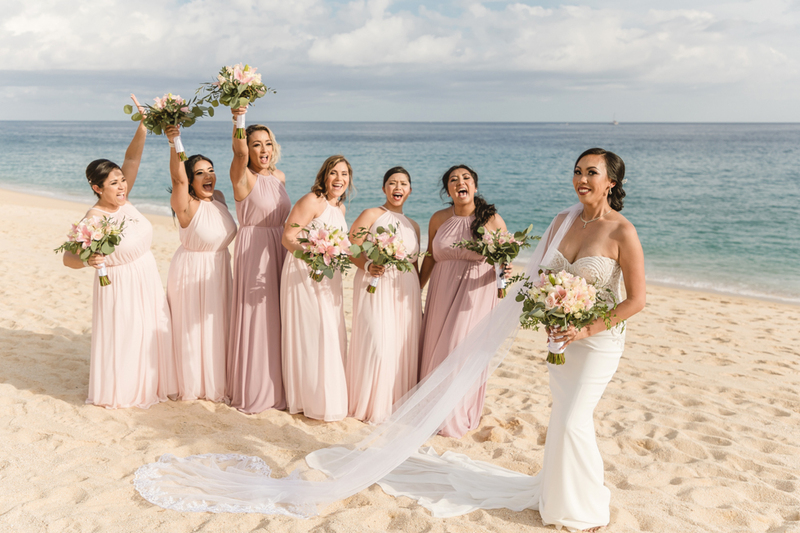 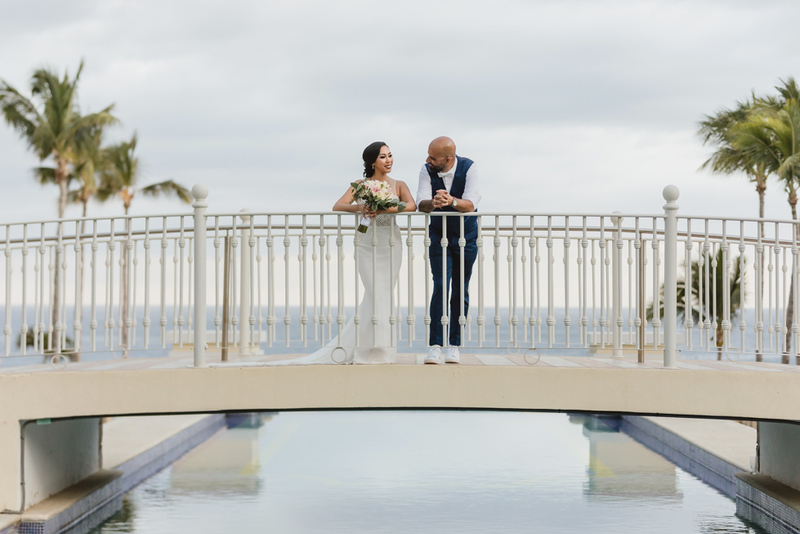 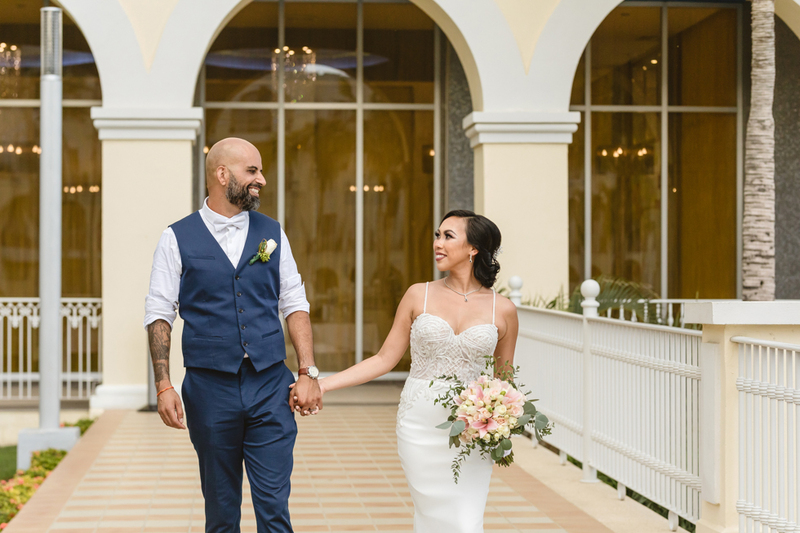 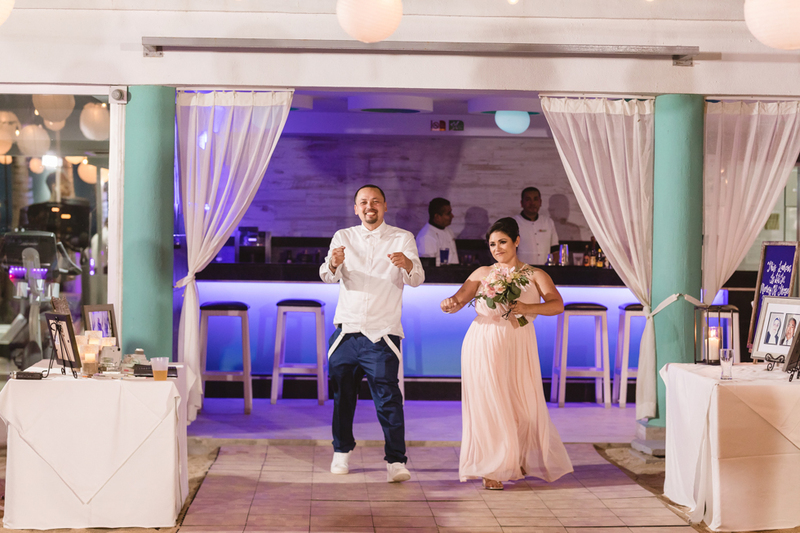 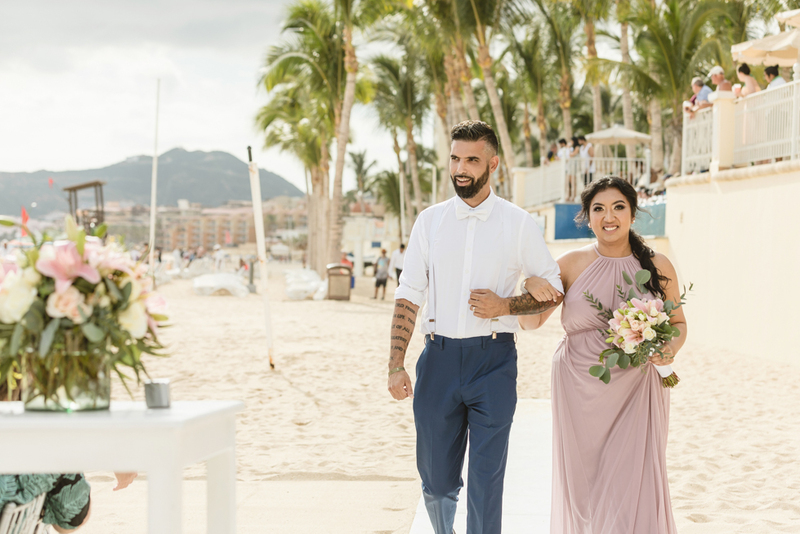 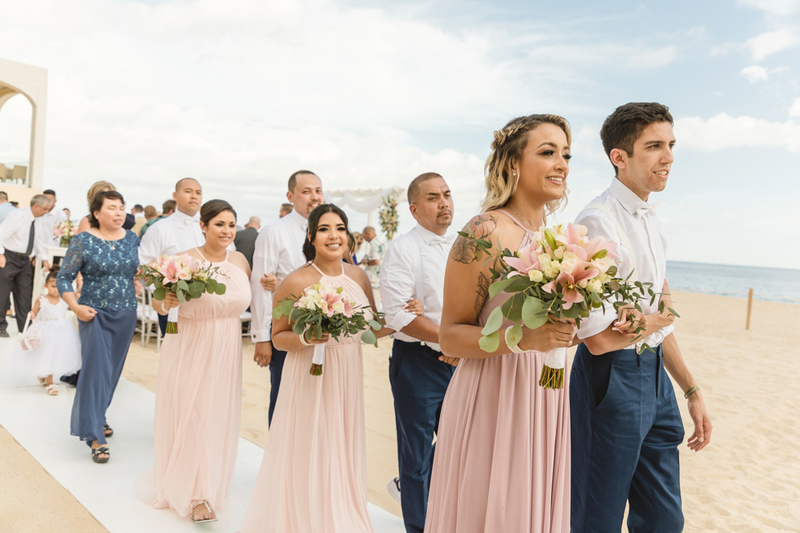 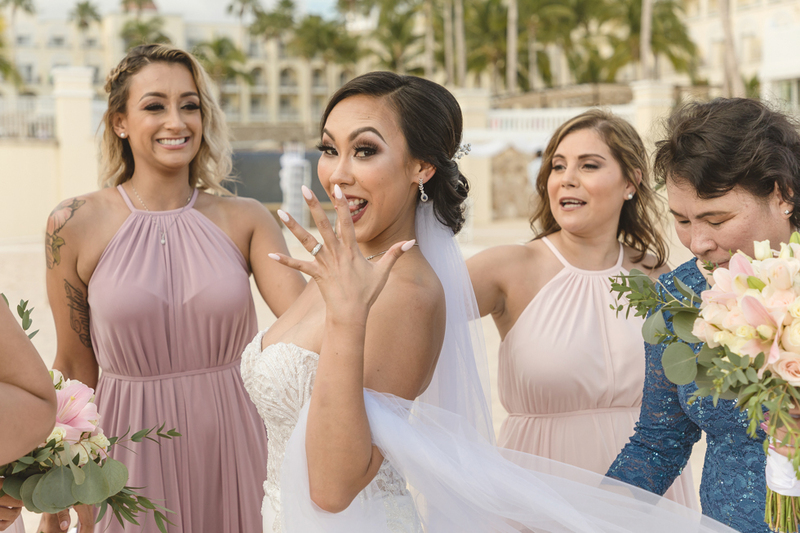 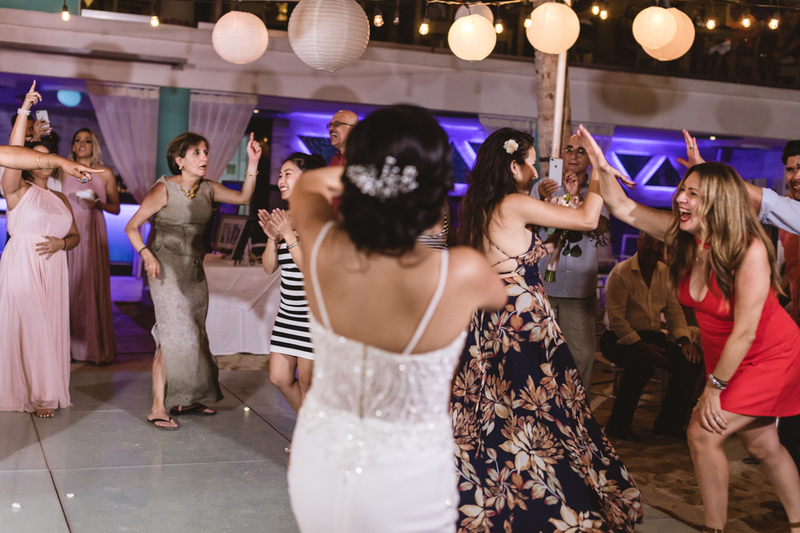 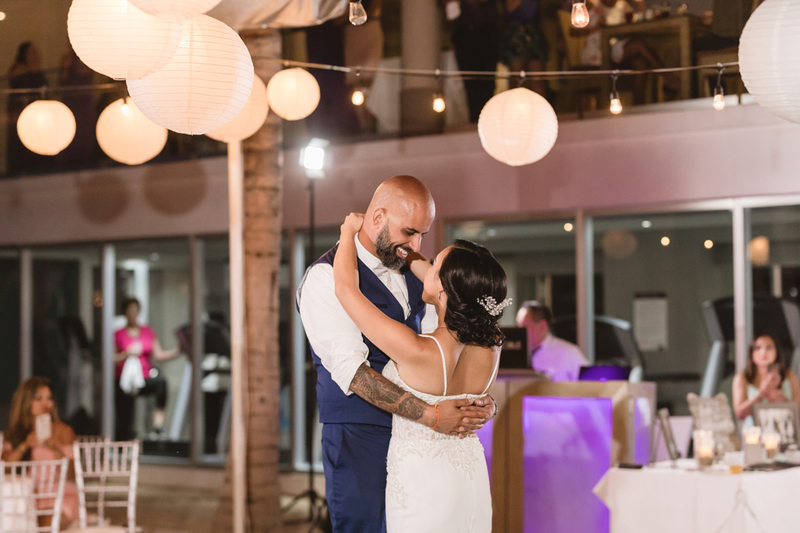 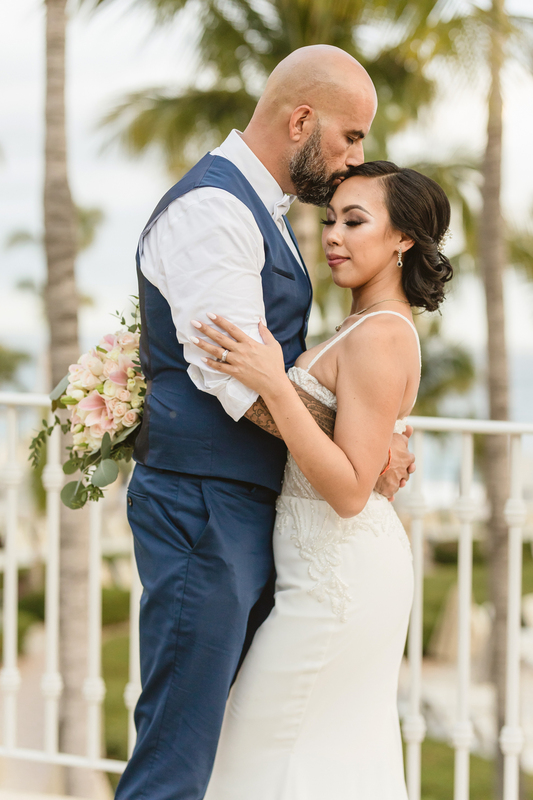 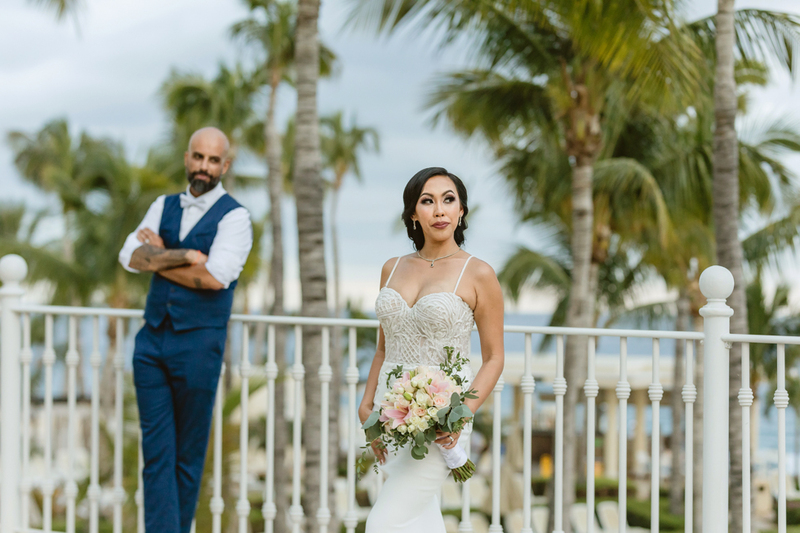 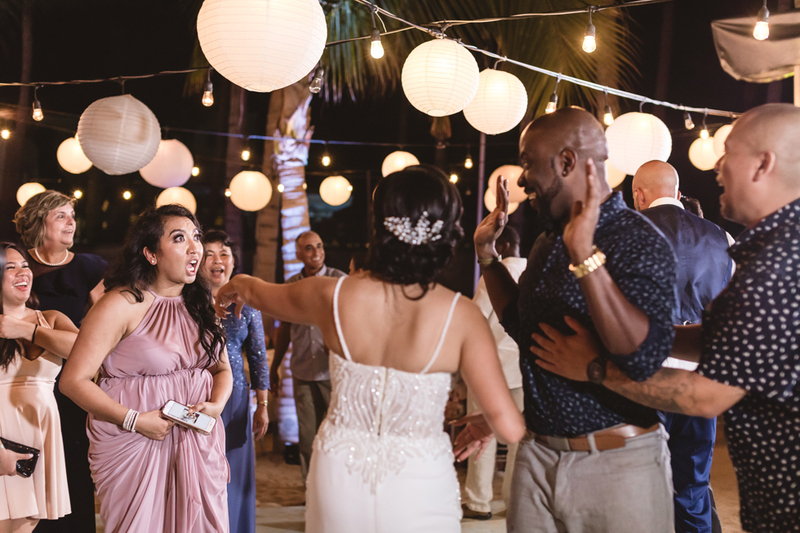 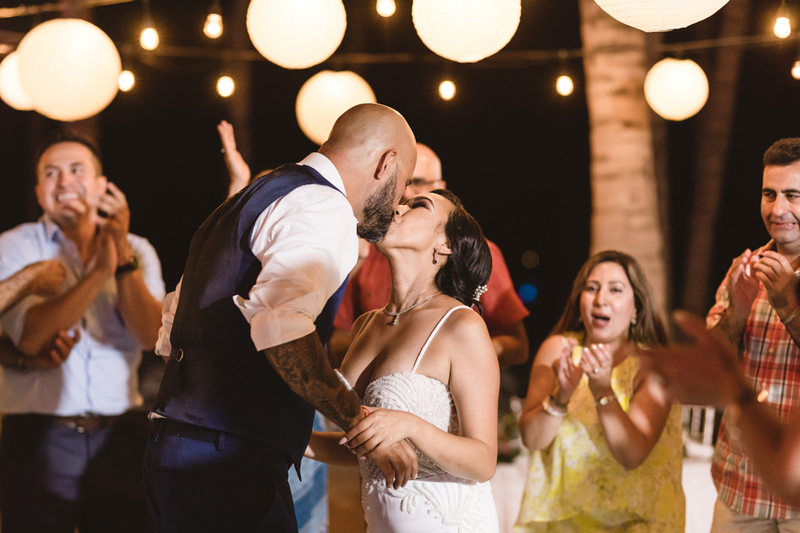 Salida is nothing if not stylish and her Cabo wedding look certainly showed us what she’s made of. 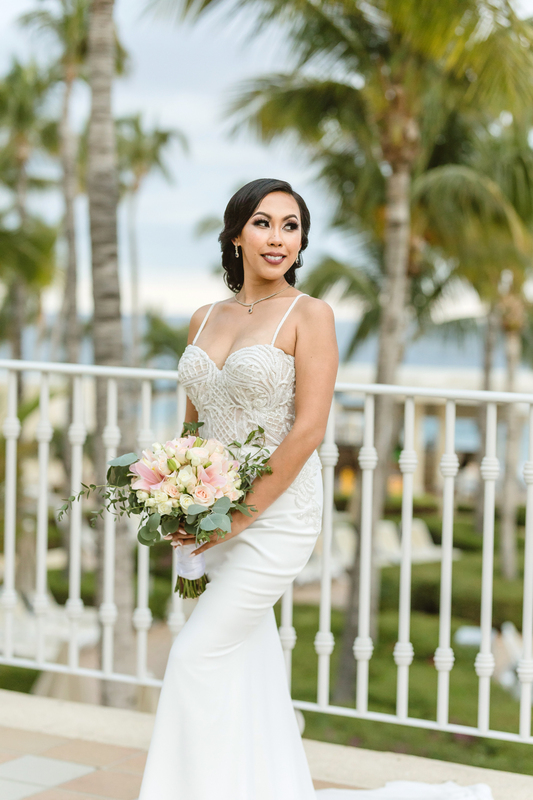 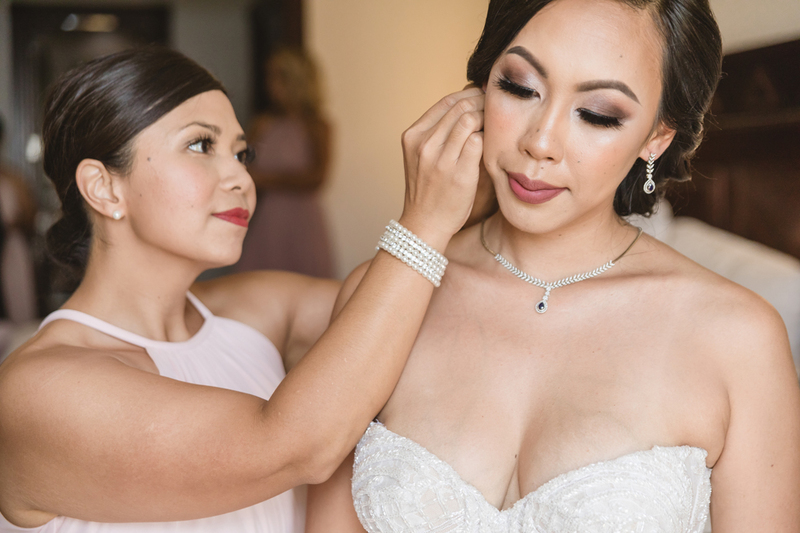 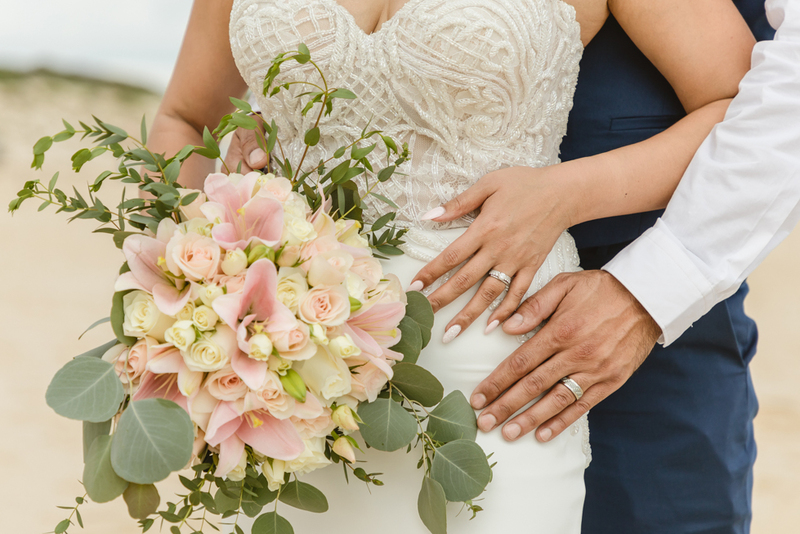 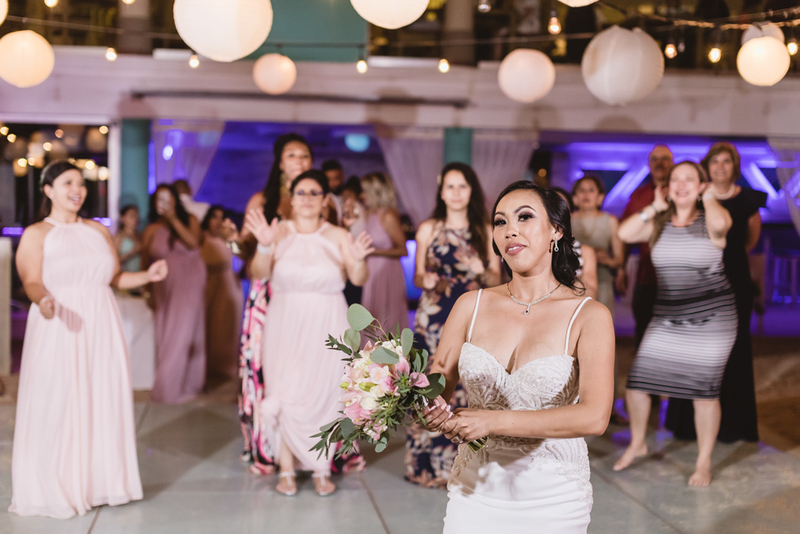 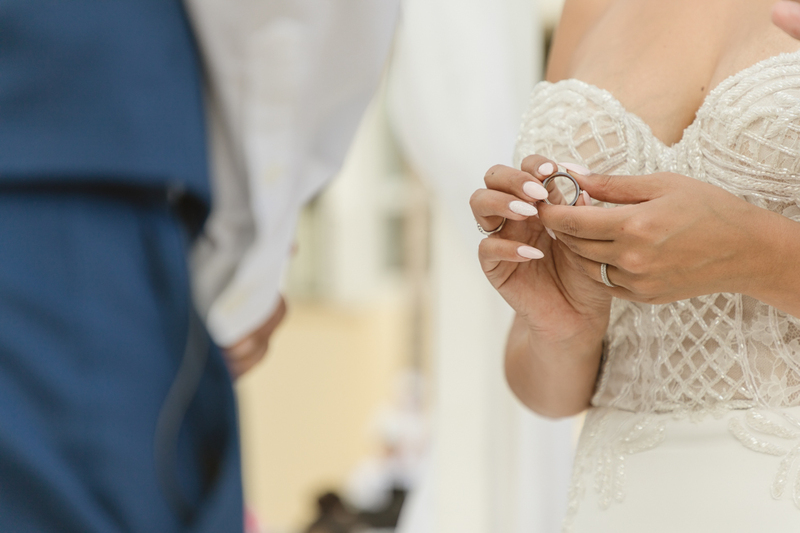 Her gorgeous ivory gown featured a lace bodice reminiscent of old world crochet, and her spaghetti straps were a welcome change from this season’s strapless trend. 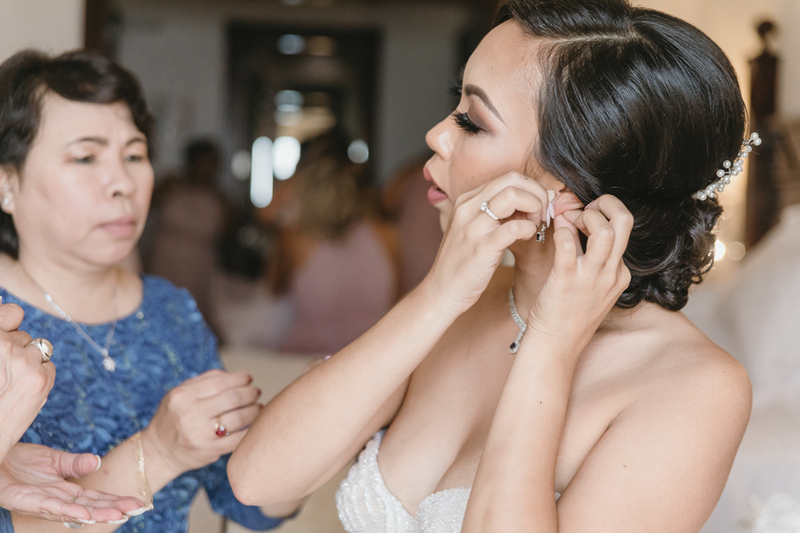 Her shiny locks looked regal in a low bun with volume at the crown and, as a leader rather than a follower, Salida opted to forego the natural makeup trend in favor of something more her style. 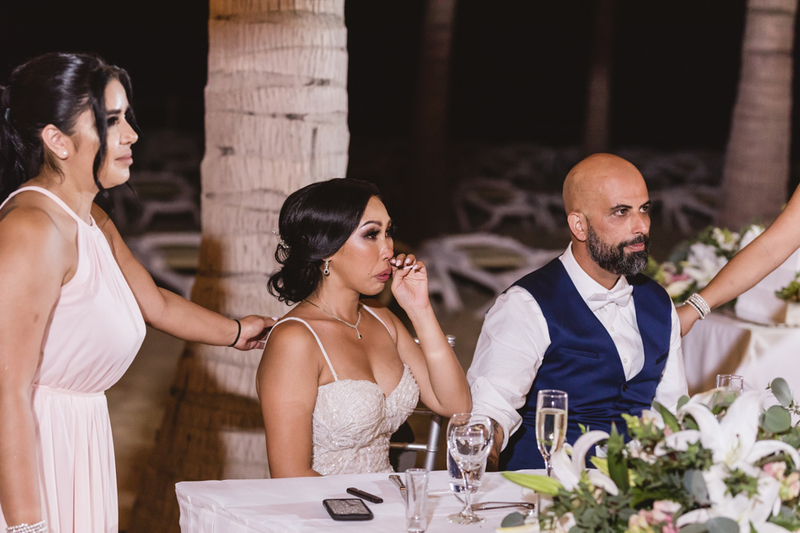 A dramatic smoky eye and contouring pared with voluminous black lashes and a dark red-brown lip left no mistaking who was the star of this show. 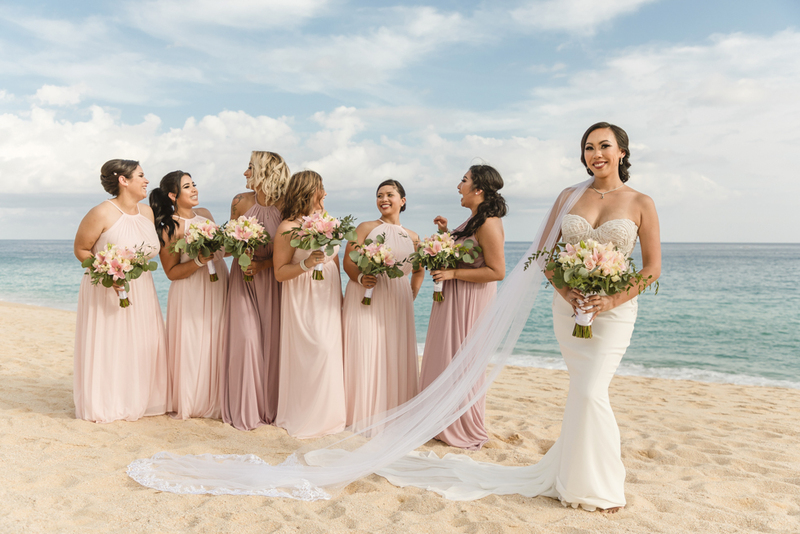 Her peacock feather inspired pearl headpiece and long, translucent veil was the icing on the cake, and her 6 lovely bridesmaids backed her up beautifully in pale pink and mauve, empire waist ensembles. 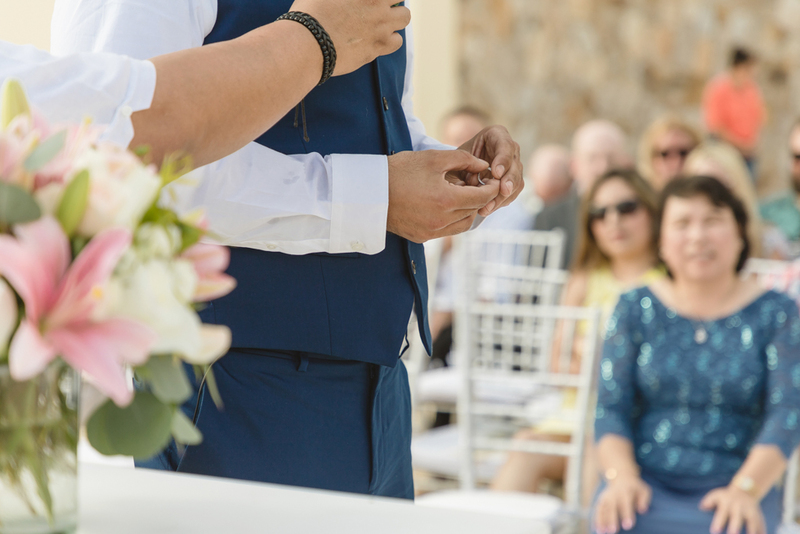 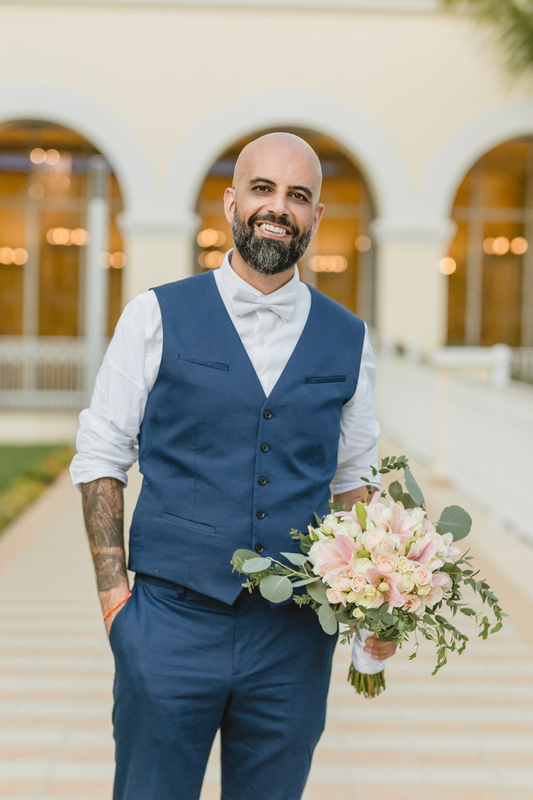 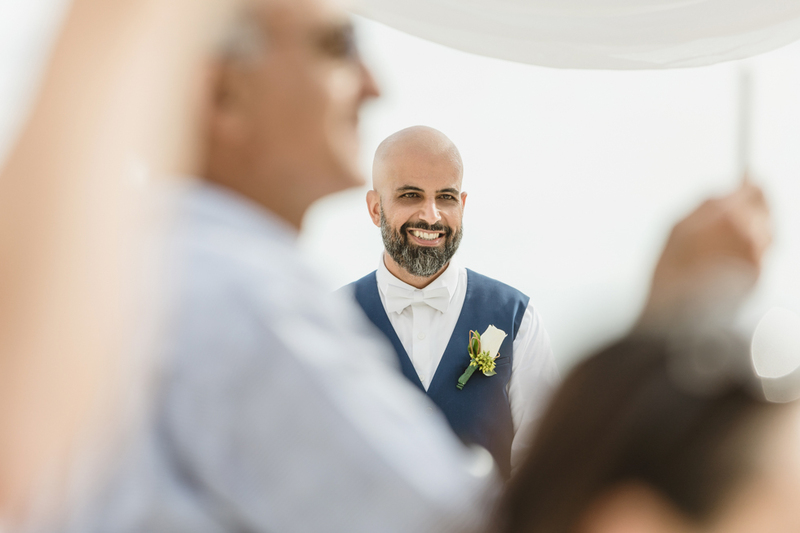 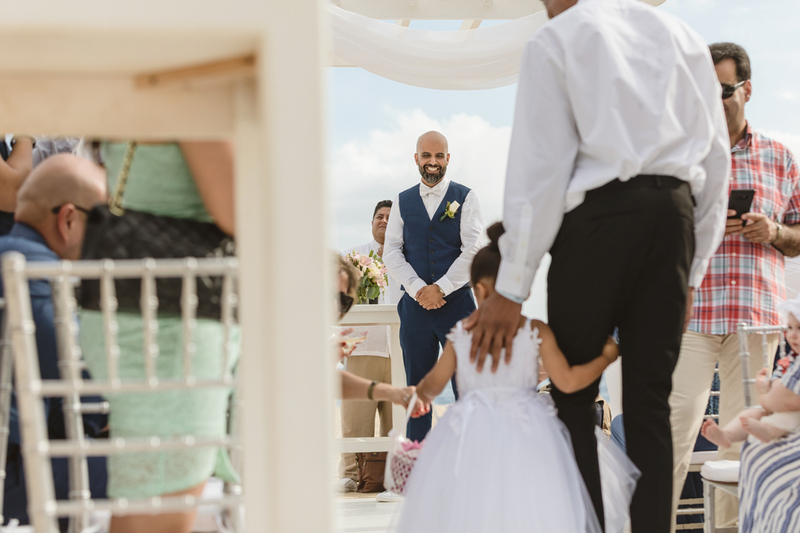 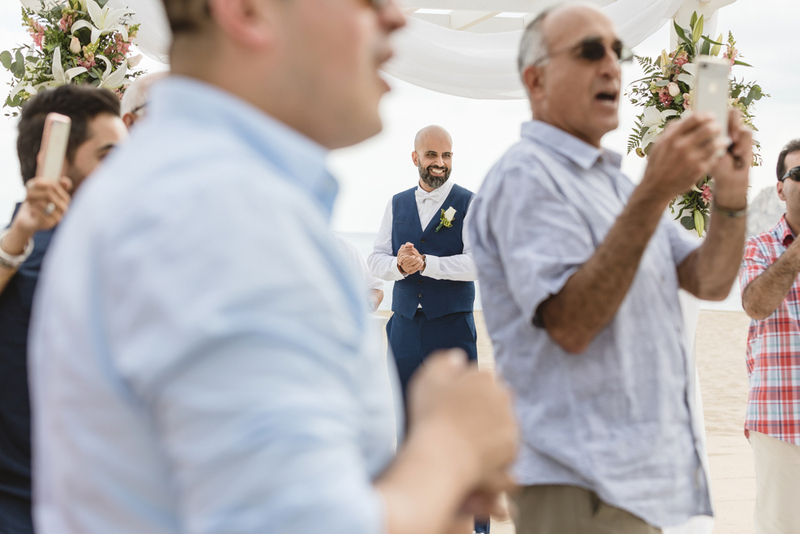 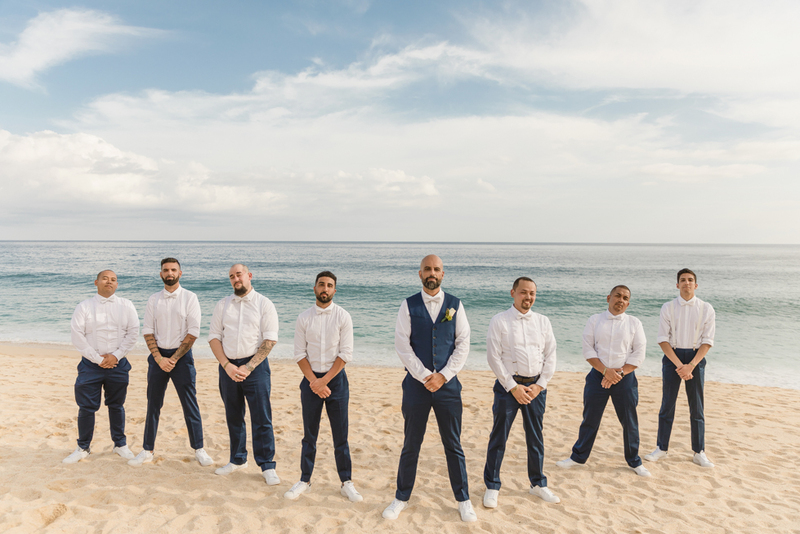 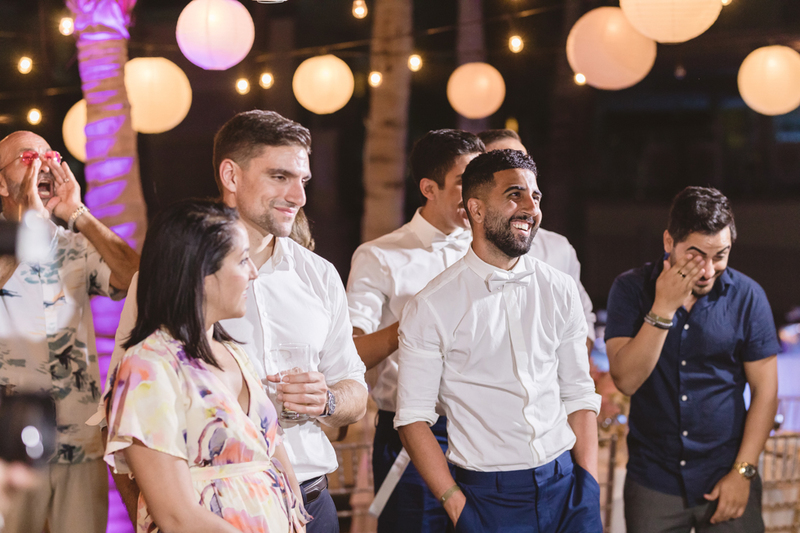 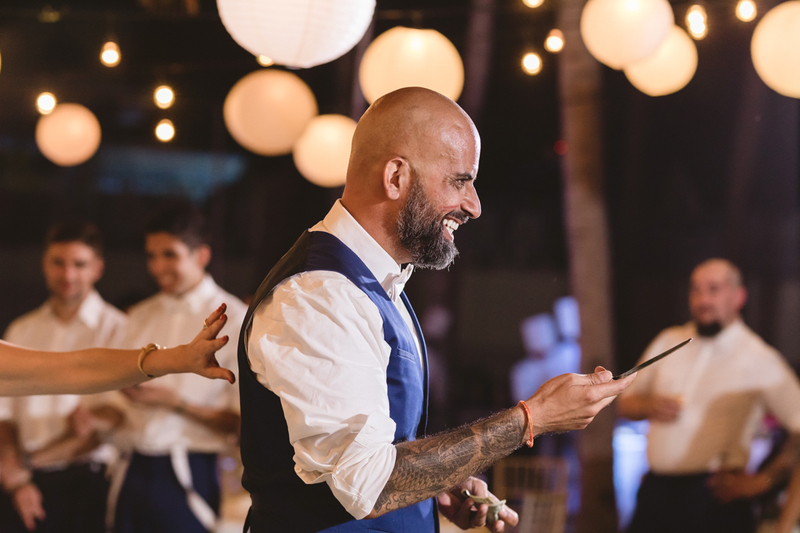 On the other side of the resort, Shahram was sharp in navy blue and white, with his groomsmen looking cool, calm and collected in white suspenders and bow ties. 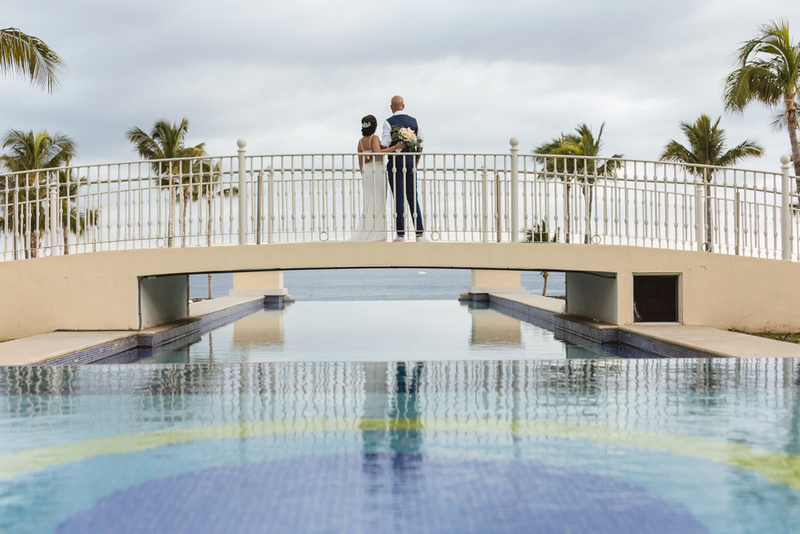 The idle passerby would be forgiven for mistaking this for a celebrity wedding given the number of spectators watching on from the hotel’s balconies and infinity pool come ceremony time. 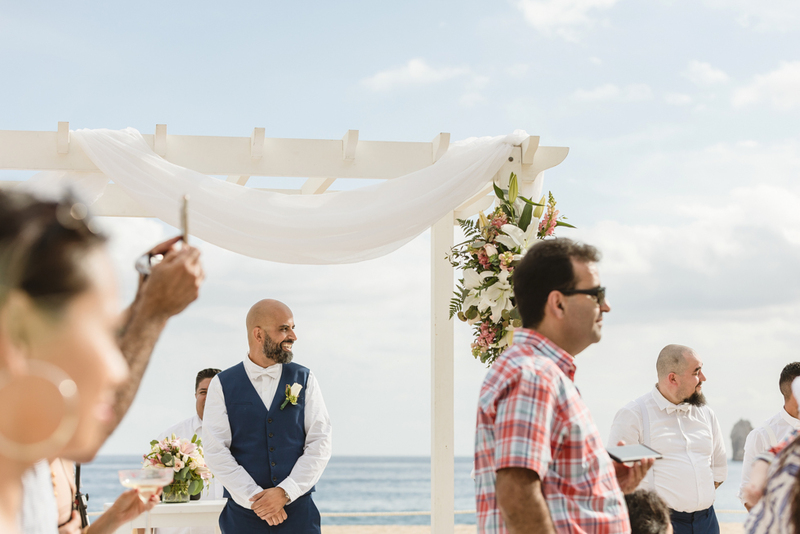 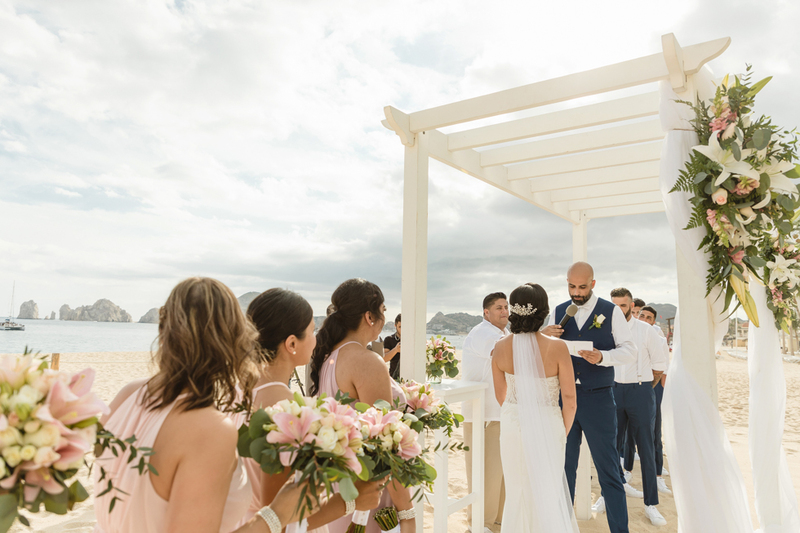 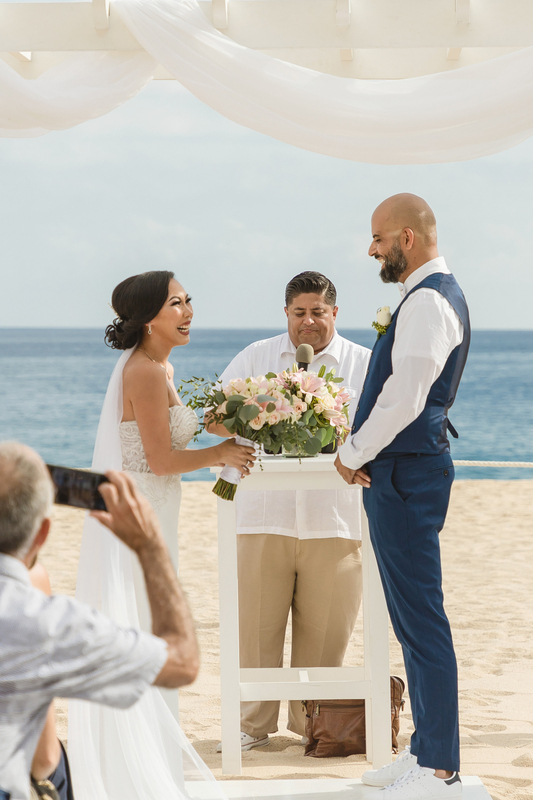 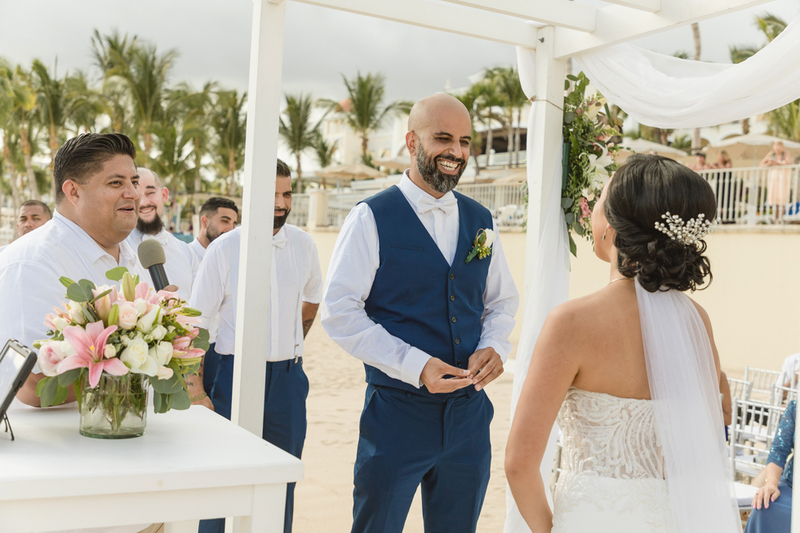 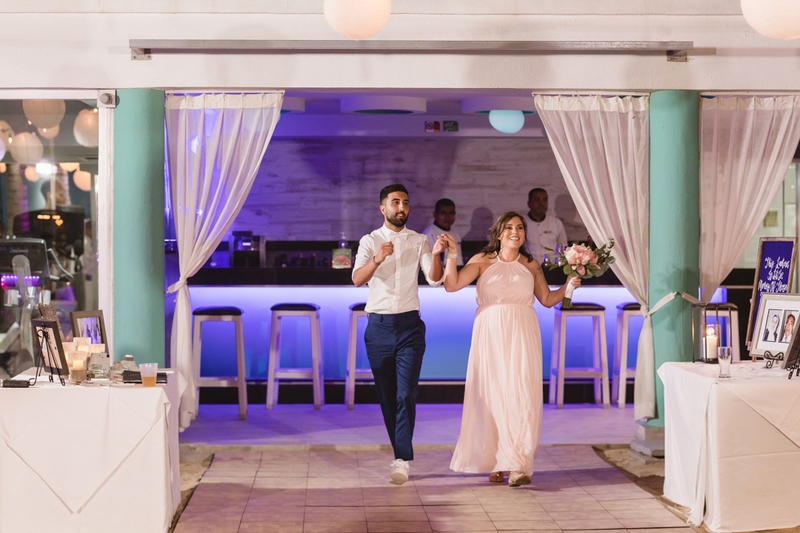 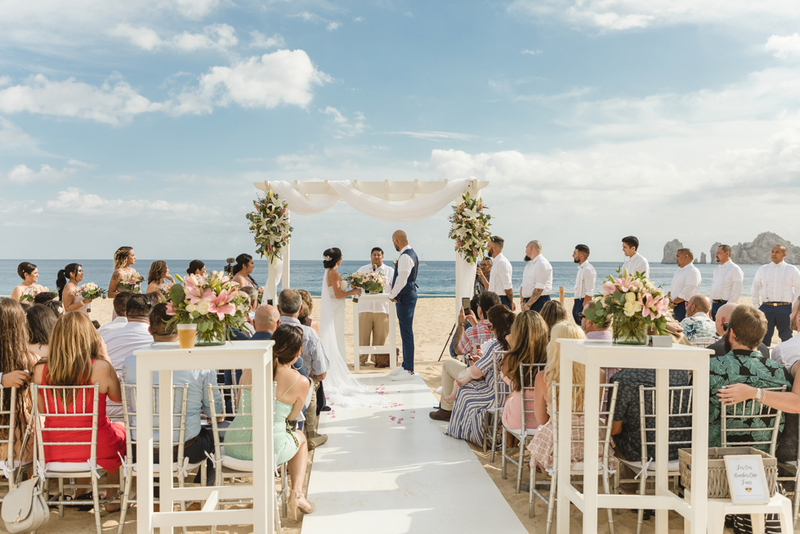 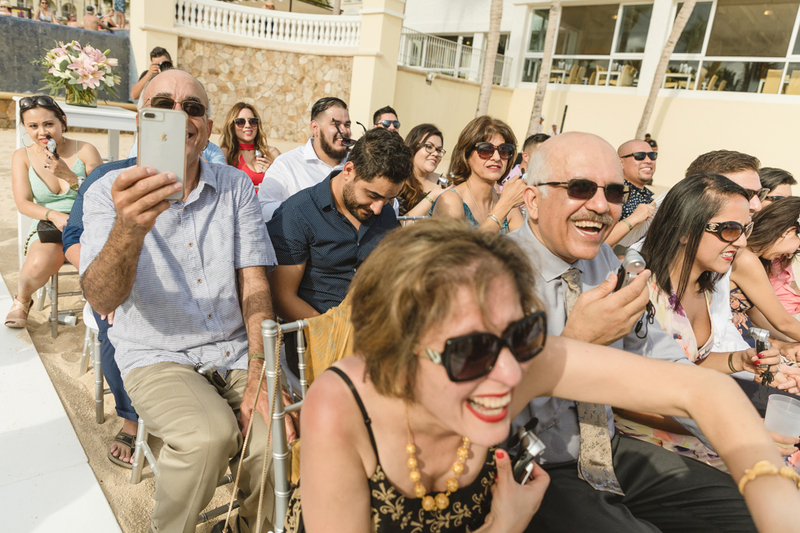 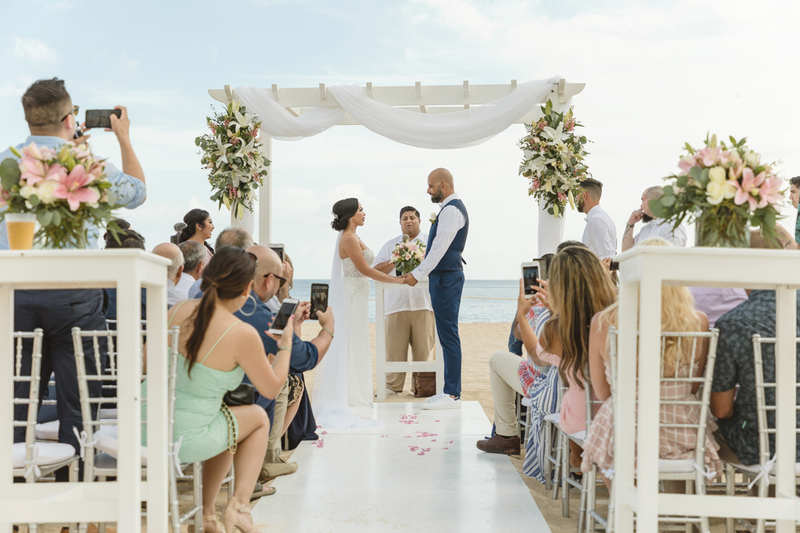 Toes-in-the-sand and beneath a beautiful white wooden chuppah, Minister Marco conducted a heartfelt, personalized ceremony which inspired both laughter and tears, before Salida and Shahram shared their personal vows with one another. 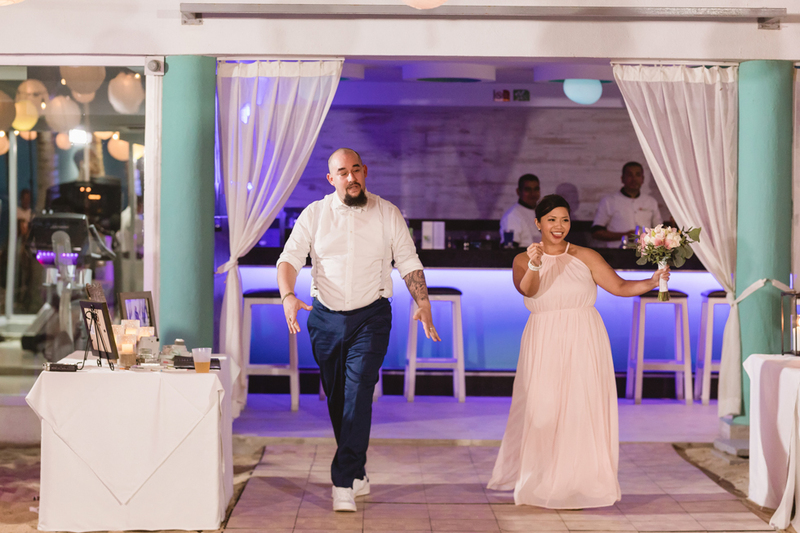 Officially presented to family and friends as husband and wife, it took little time for the formalities to give way to the party! 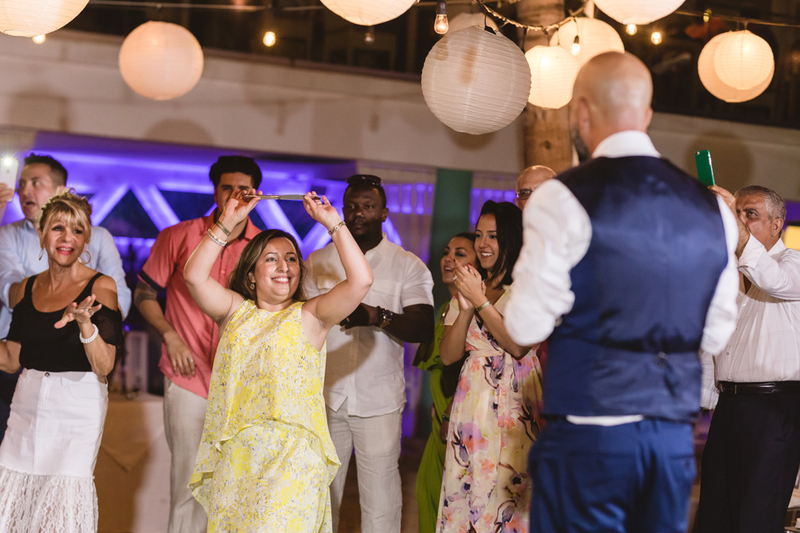 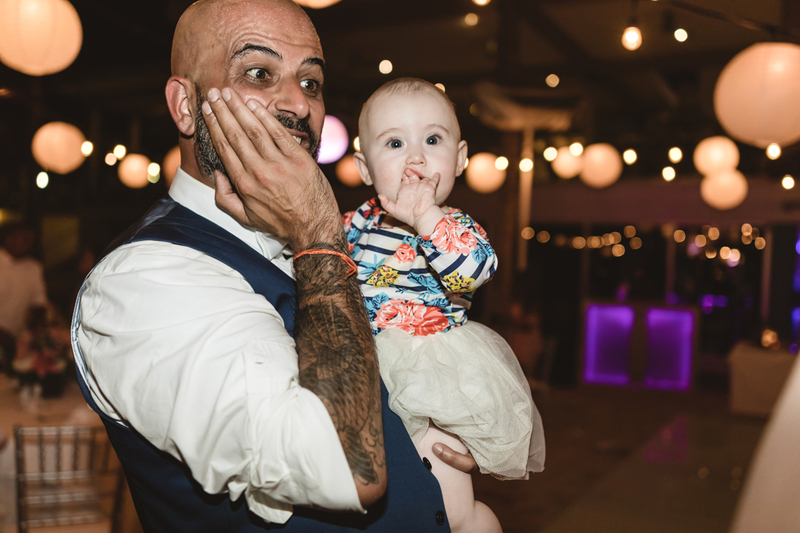 With a close family friend on the decks, Salida, Shahram and their guests danced to an energetic mix of everything from hip hop and RnB to Top 40. 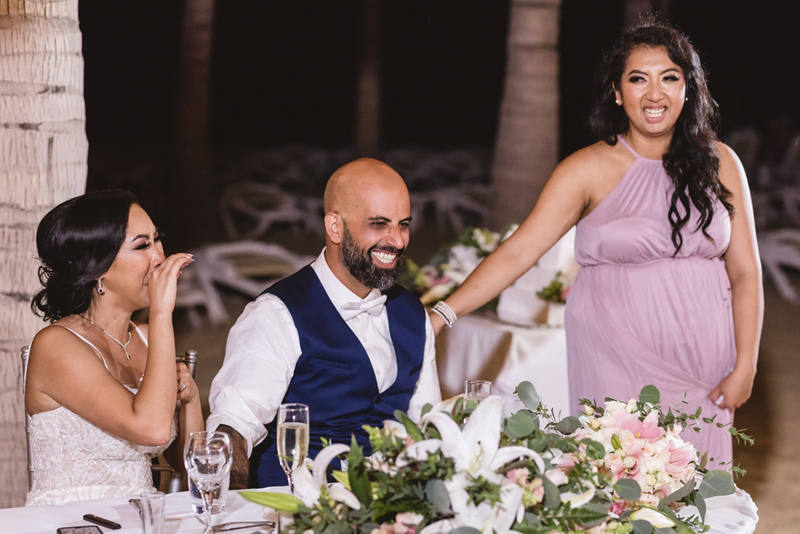 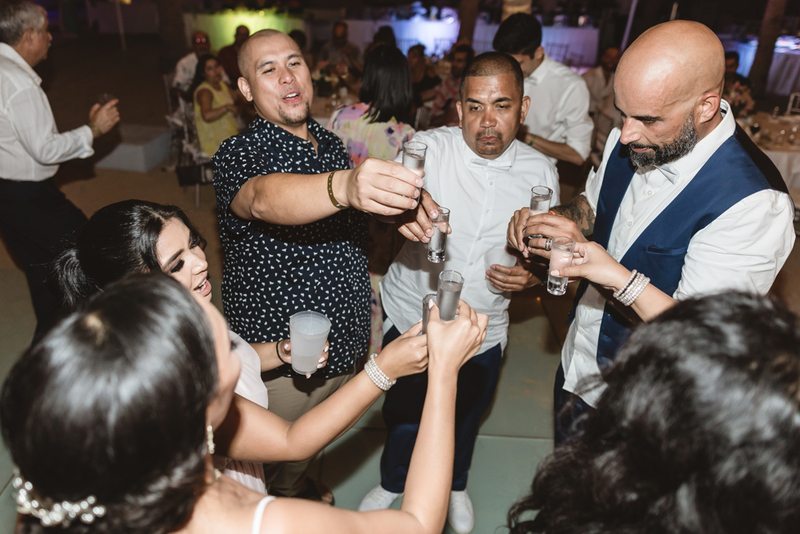 Tequila shots were the go-to drink of the evening, as guests dined at gorgeous tablescapes featuring crisp white linens and an abundance of pale pink and cream mini roses and exotic cymbidium orchids. 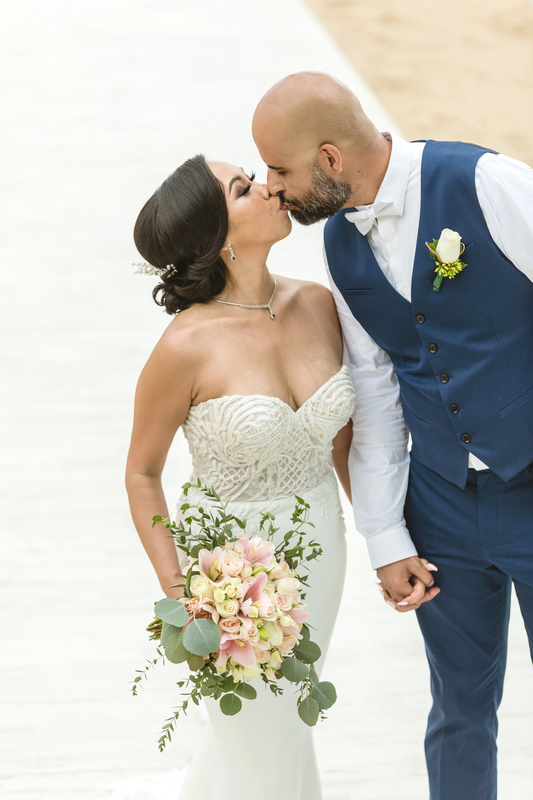 All in all, one stylish wedding for one very stylish couple. 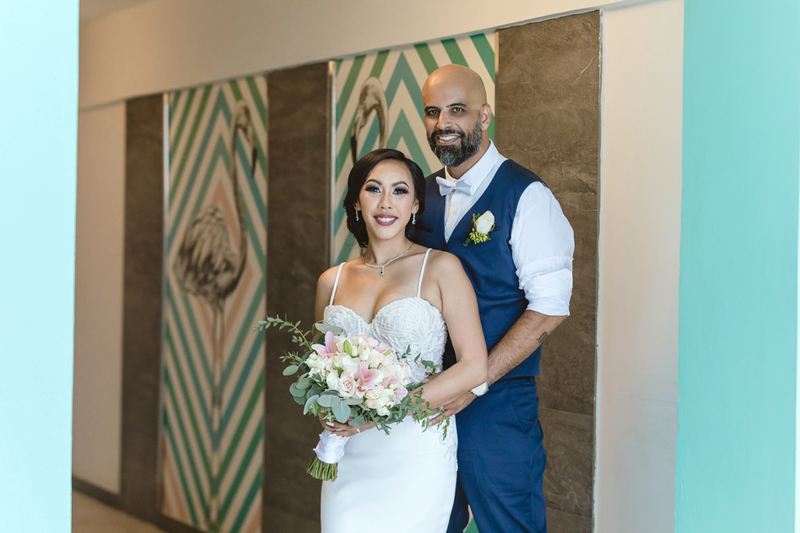 Congratulations Salida and Shahram – we loved every minute spent with you and wish you a lifetime of happiness as husband and wife.